Although I had visited Alaska 10 years ago it was purely for the airshow at Elmendorf AFB. 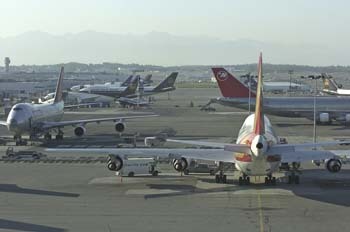 At that time there was little activity at the main airport - which was contrary to what I had heard about it in the 70's. 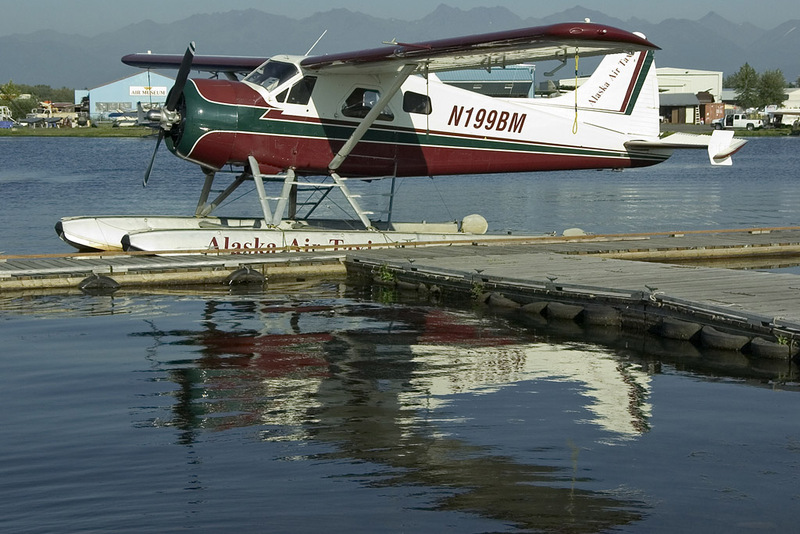 Things were on the up again at Anchorage and in general in Alaska so a return visit was well overdue and fortunately my good friend Steve Kinder was organizing a trip, albeit a very short one, to that very place. 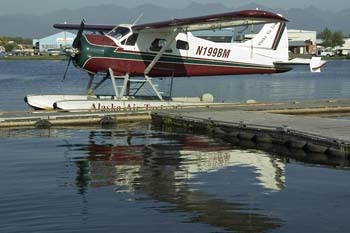 Alaska is about 7000 miles and 18 hours traveling from the UK - so its not exactly close - especially for a 4 day visit! In the weeks prior to going I had been keeping a close eye on the weather and it wasn't looking good so I was extremely surprised when I landed in glorious sunshine at ANC! 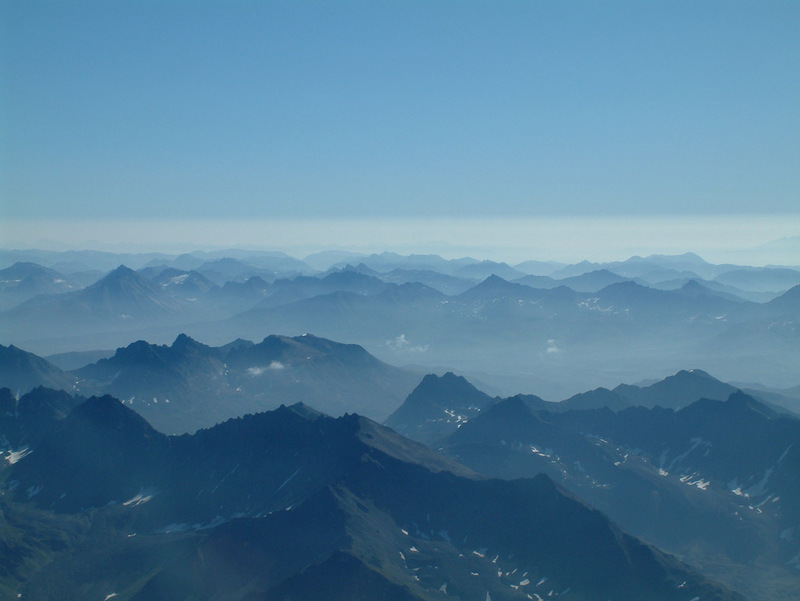 In fact everyone we spoke to was surprised that we thought the weather was going to be bad - they had experienced this weather for weeks. Our first full day in Alaska was to be the main purpose of the trip. 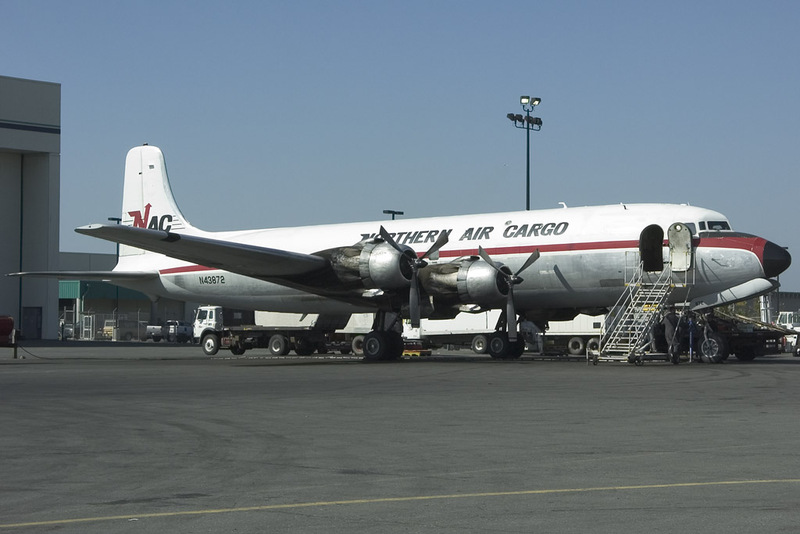 We had chartered an aircraft for the day, a Super DC-3 - not a regular one - allocated tail number N30TN and now operated by Trans Northern. 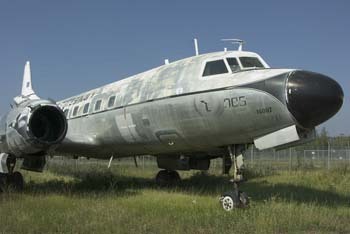 This particular aircraft was originally ordered back in October 1940 by American Airlines with a right-hand rear door and with the registration NC33662 reserved, but was not delivered. 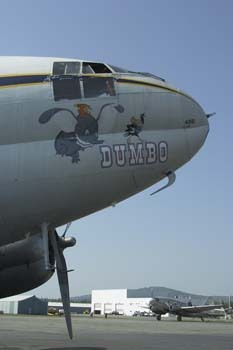 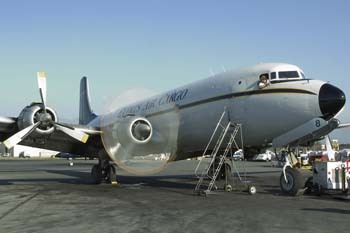 With the onset of war it was appropriated by the USAAF before being built and several changes were made to the spec of the aircraft including the door being moved to the left-hand side of the aircraft and unlike many DC-3/C-47 counterparts was not fitted with a cargo door so was most likely used as a hack for Generals - it entered service 10th January 1941 with the serial 41-7700 (c/n 4122) as a model C-50 and not a C-47. 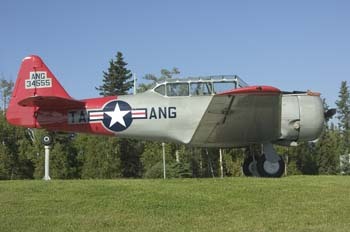 It was released from USAAF service in May 1944 and was offered for sale back to American Airlines. A sum of approximately $55K was agreed and the aircraft entered civilian service on 3rd July 1944 as "Flagship New Jersey". 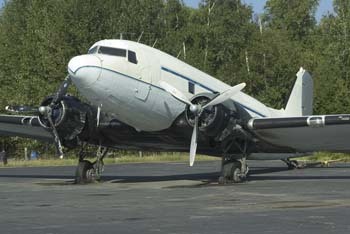 It was subsequently sold back to the Douglas Aircraft Co. 15th February 1949 where it became the second airframe to be converted to a DC-3S, or, Super DC-3 at which point the c/n changed to 43159. 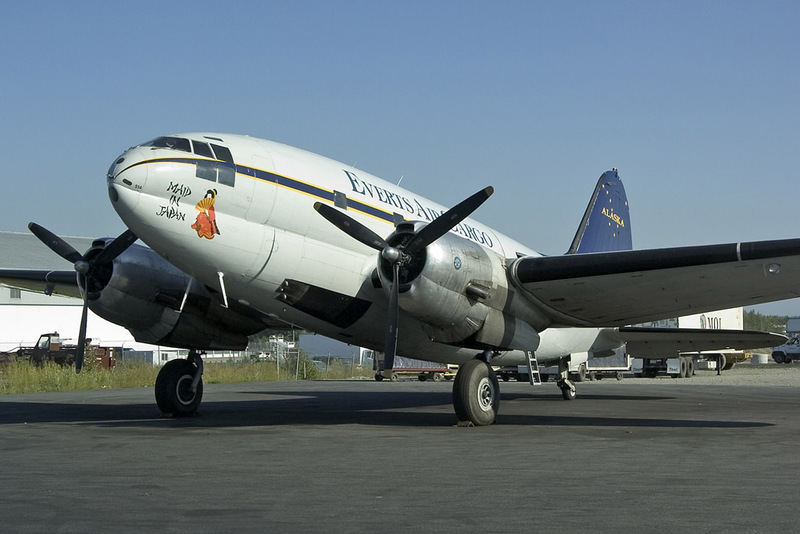 This was the second DC-3S to be converted and carried the registration N30000. The Super DC-3 differs from a regular DC-3 because a 39" plug that is inserted in the fuselage just forward of the wings, allowing for a total load of 31 passengers, as well as its distinctive square tail. It also benefited from larger fuel tanks - 1600 gallons, and upgraded engines which together helped to increase its take-off payload and range. 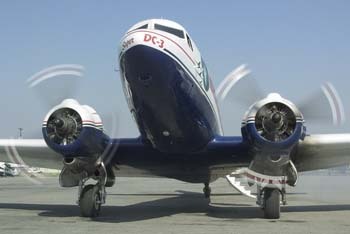 Douglas went on a 10,000 mile promotion and sales tour and everyone loved the aircraft and its performance. 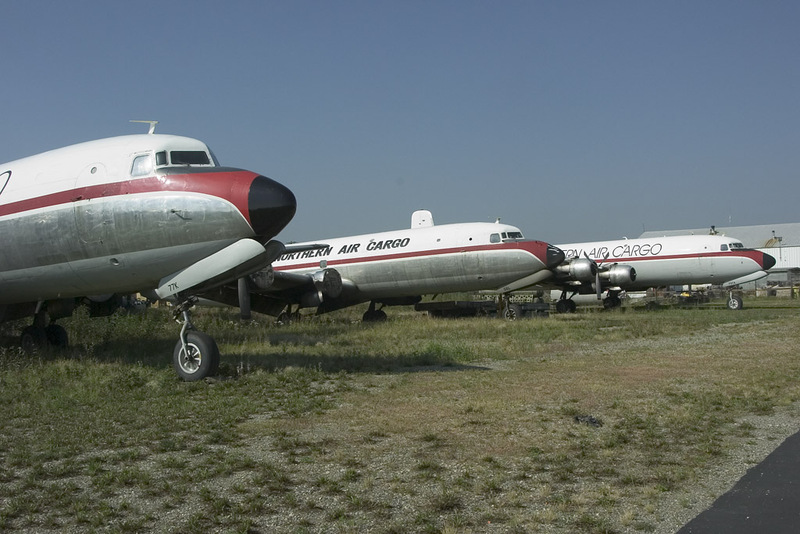 However, when Airlines were faced with a bill for $200,000 for a Super DC-3 or $8,000 for a surplus DC-3/C-47, and there were lots of surplus airframes around, the writing was on the wall for the aircraft. The sales tour had only produced sales of 3 aircraft for Capitol Airlines and had it not been for the 100 conversions from old DC-3/C-47/R4D airframes for the US Navy as the R4D-8 then the Super DC-3 program would have been a complete disaster. 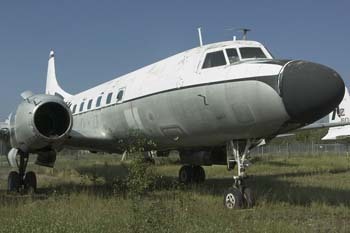 C/n 43159 has had a mixed career but has mainly been used in an executive configuration -only having a passenger door and without the reinforced flooring its options, without an expensive conversion, were always going to be limited. 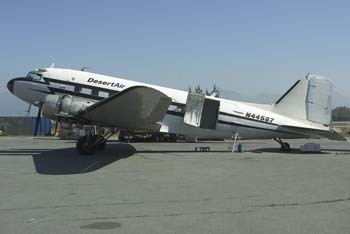 It was seven years before Douglas finally sold the aircraft to the Harburt Construction Company as N322HC in 1958. 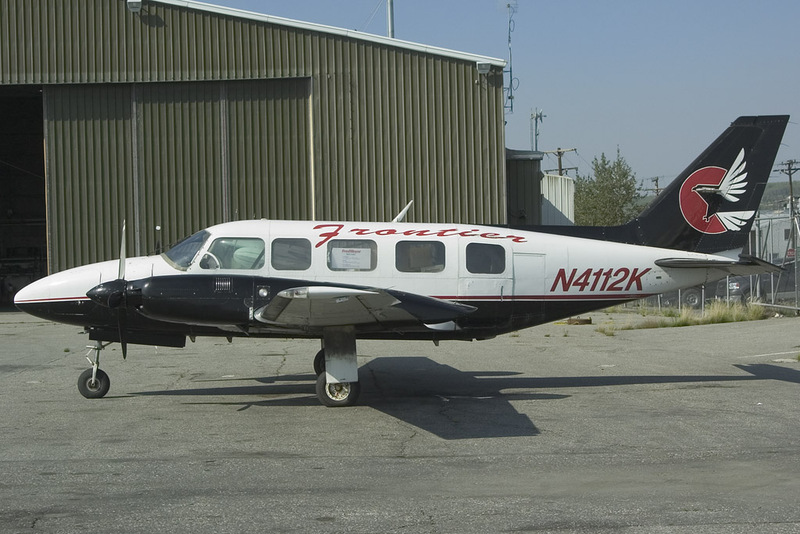 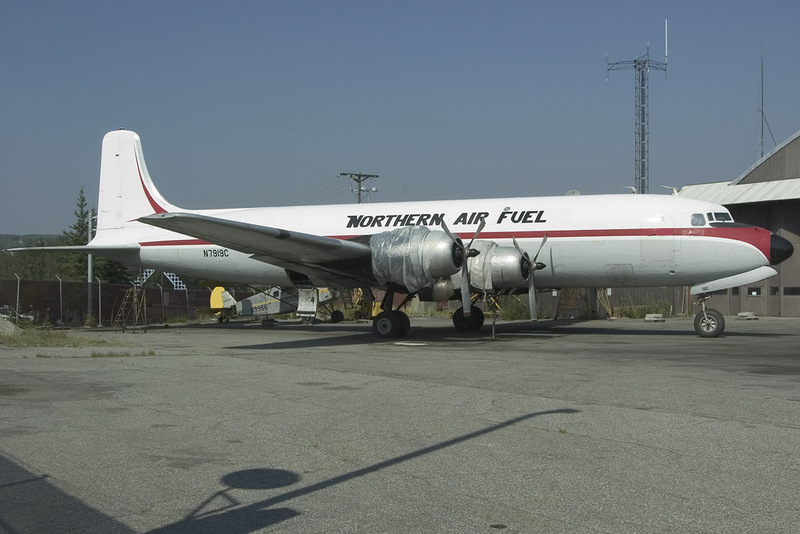 Three years later it was sold to Raytheon who operated it for a couple of years as N223R who in turn sold the aircraft in 1963 to the Burdick Grain Co. in Minneapolis as N6811. 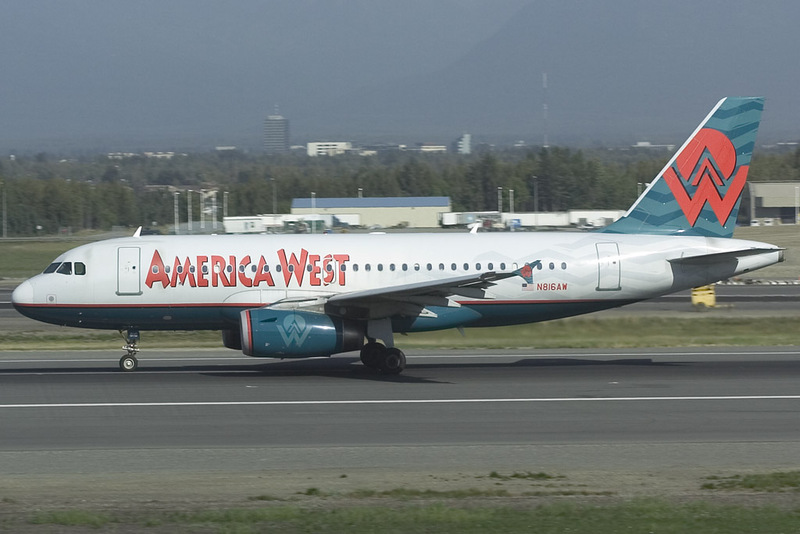 Three years later it was sold to Mercantile Bank of Monterey in Mexico where it was registered as XB-NIW and it stayed for over six years. 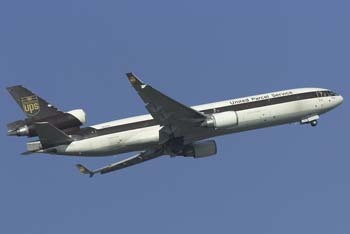 The aircraft was re-imported privately to the USA as N567M in December 1972 and in August 1976 was sold again to Air Travel Associated in Dallas, TX. 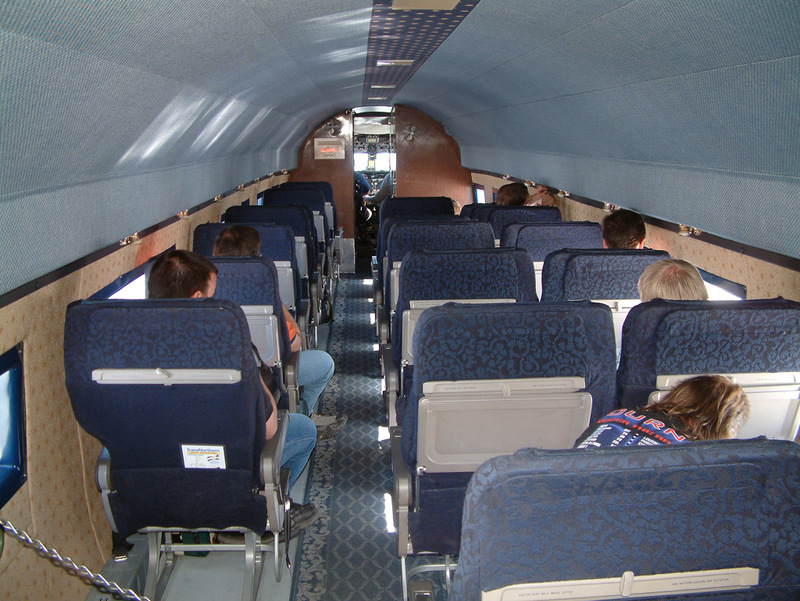 This is where the history of the aircraft becomes a little more "interesting"! In the early Eighties it was used as a drug runner on two occasions each time being seized and eventually sold on. 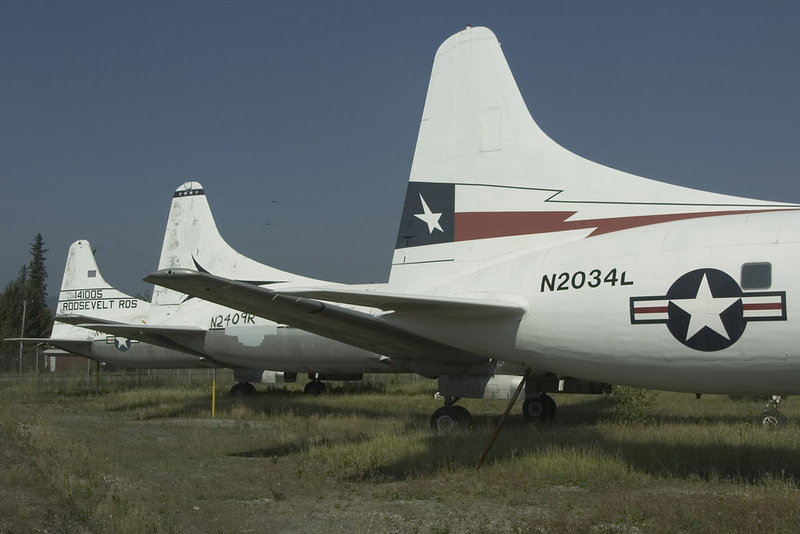 In June 1984 it was sold by the US Drug Enforcement Agency to Aviation Enterprises, Addison TX. who registered it N53315. 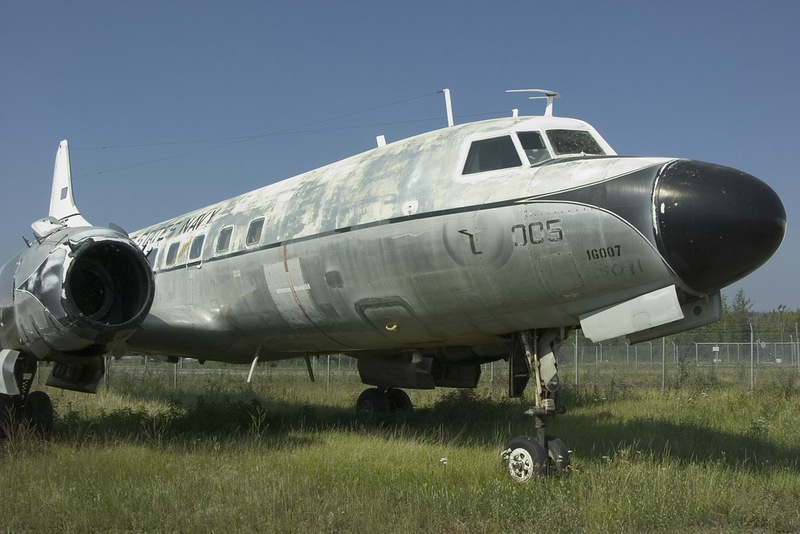 It was sold on a couple more times over the next few years finally ending up with the "City Council of Beaufort County" in South Carolina where it was used for spraying - close inspection of the undersides of the wings shows where spray bars were once attached. 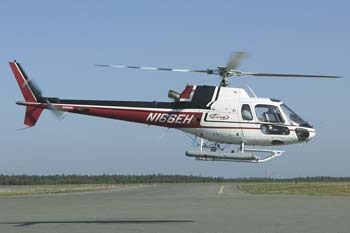 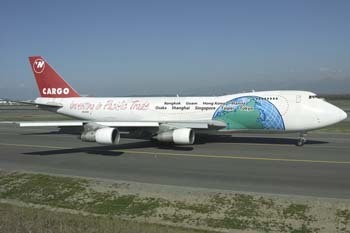 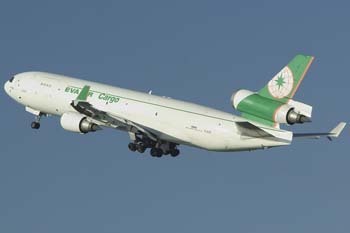 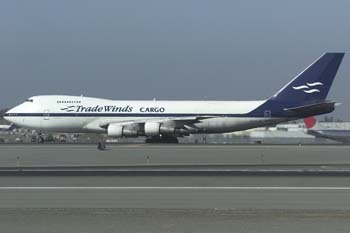 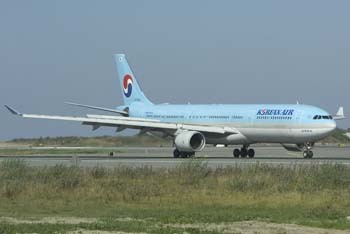 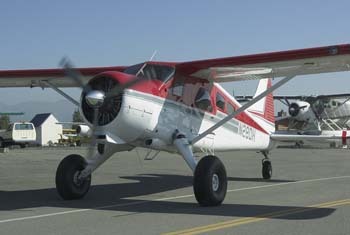 Finally in January 2003 it moved to Alaska and was registered N30TN in January 2004. 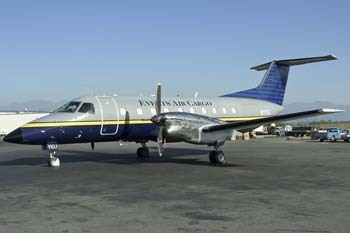 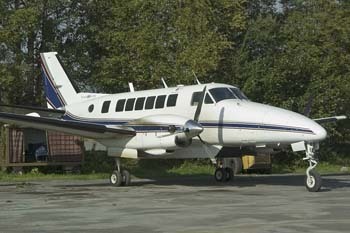 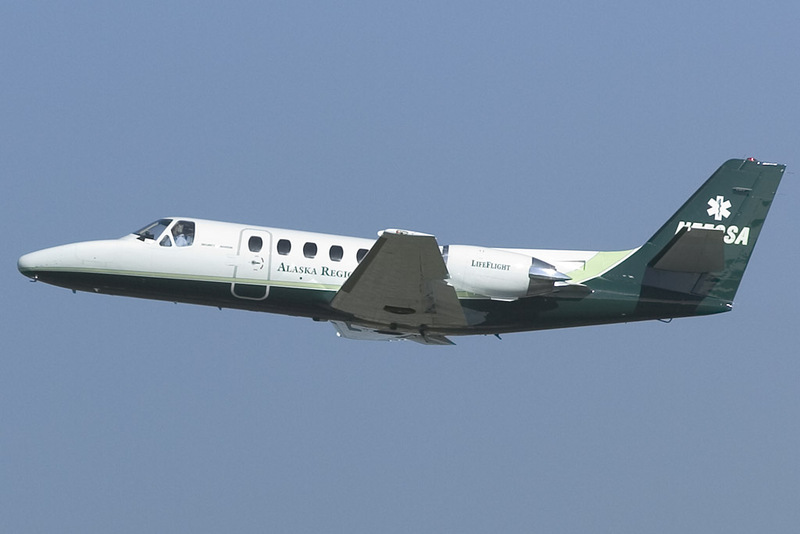 Although the FAA files show the owner as DES LLC, Wilmington, DE., Trans Northern is the current operator. 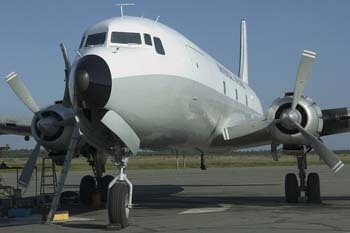 Trans Northern are very proud of this aircraft, in fact they are so proud earlier in this year the Douglas demonstrator scheme it was in (the same design from 50 years ago) was looking a little tatty so they took it Arkansas for three weeks for a re-spray and very smart it looks too. 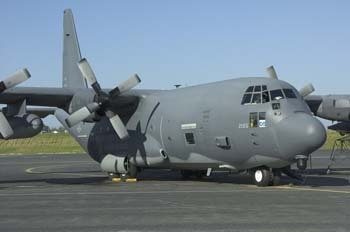 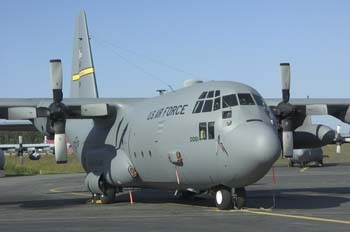 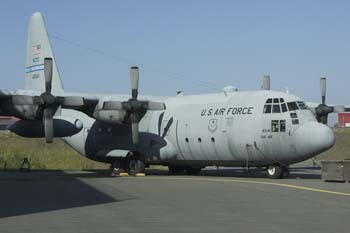 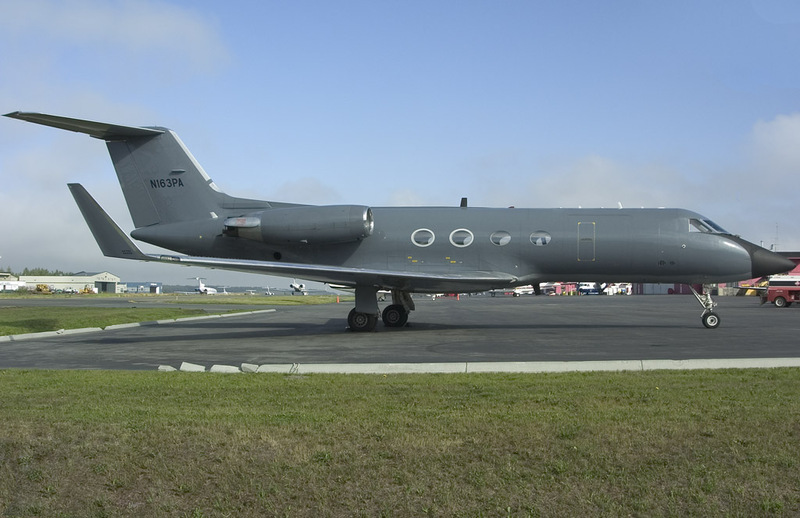 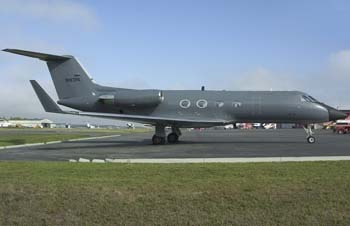 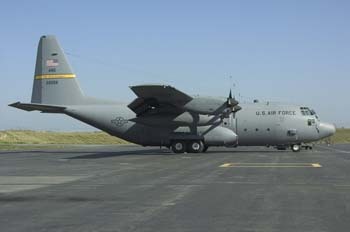 They had previously operated a C-117 (N32TN), which was also in the Douglas scheme. 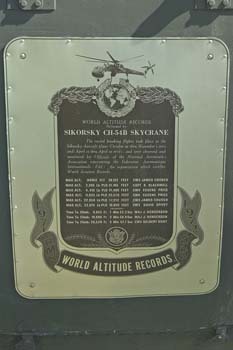 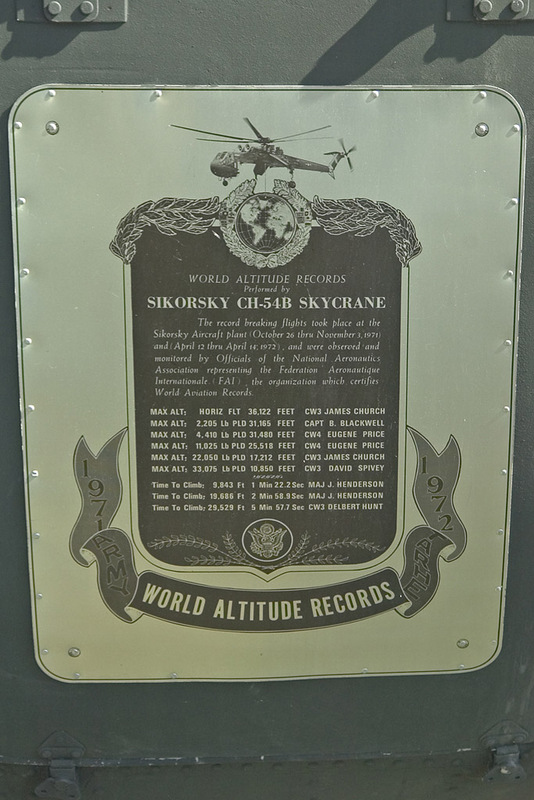 The days itinerary was simply to fly up to Fairbanks, spend several hours on the ramps up there and then fly back to Anchorage. 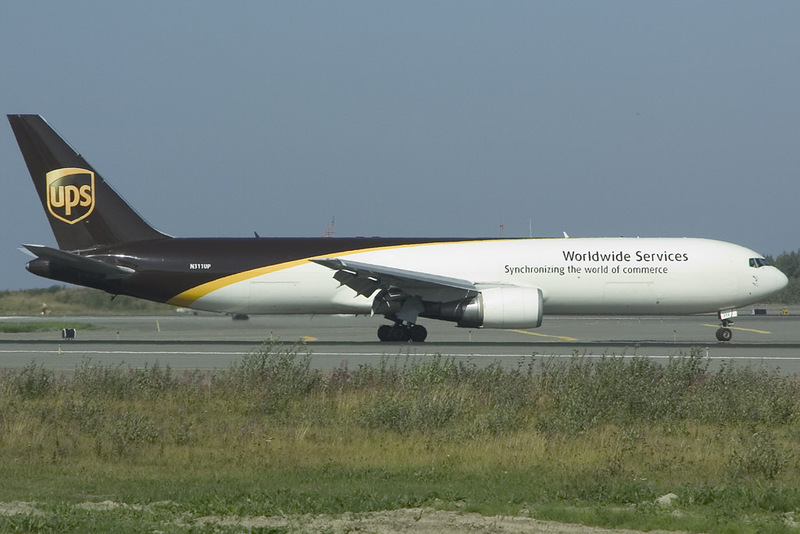 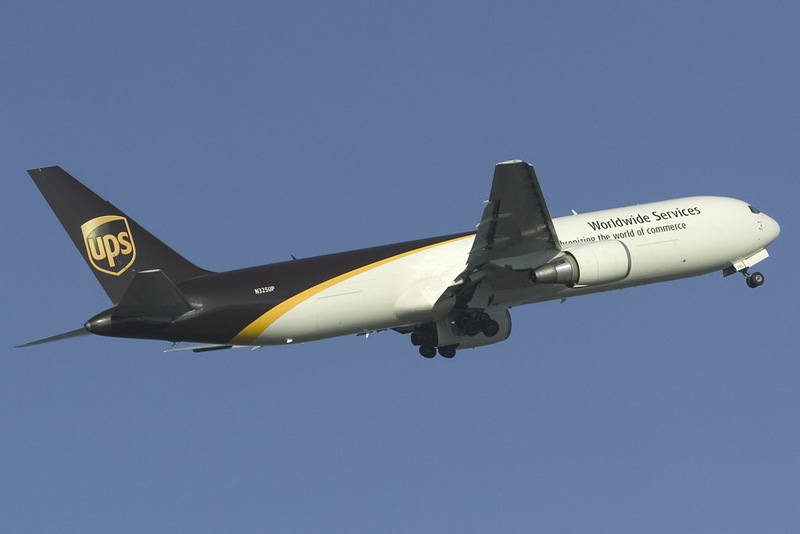 However, once boarded, our Captain advised us that there was going to be a small change to the itinerary and he didn't think we would mind - UPS needed some parcels taking to a place called Kenai and it would add about an hour onto the trip but at no extra cost. 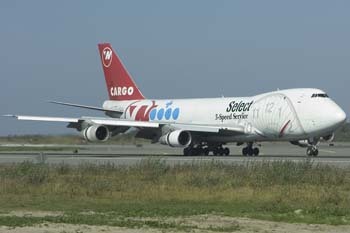 We had no objections at all - in fact this worked massively in our favour. 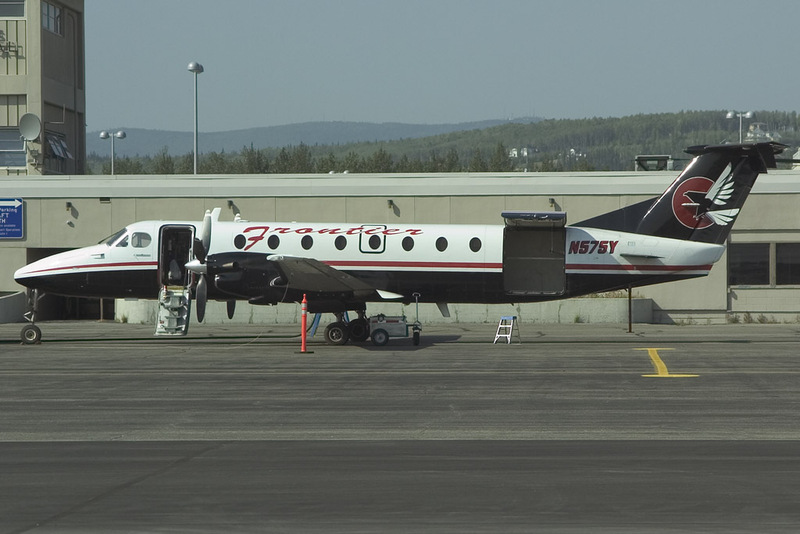 We had planned to visit Kenai as it was the home of Universal Airlines and their fleet of DC-6's so this detour was going to save us five hours of driving. 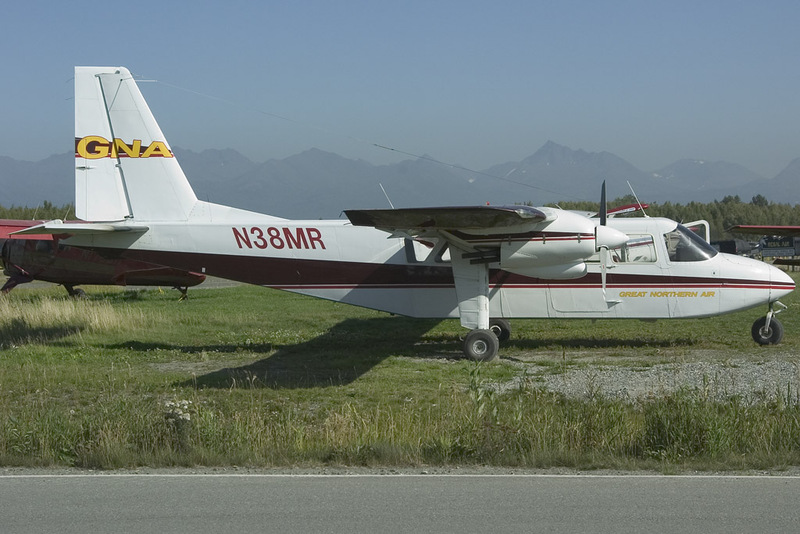 The first flight was perfect taking off on runway 17L followed by a turn towards the southwest and it was then a straight run at 1200 ft for 30 minutes with a straight in approach to Kenai. 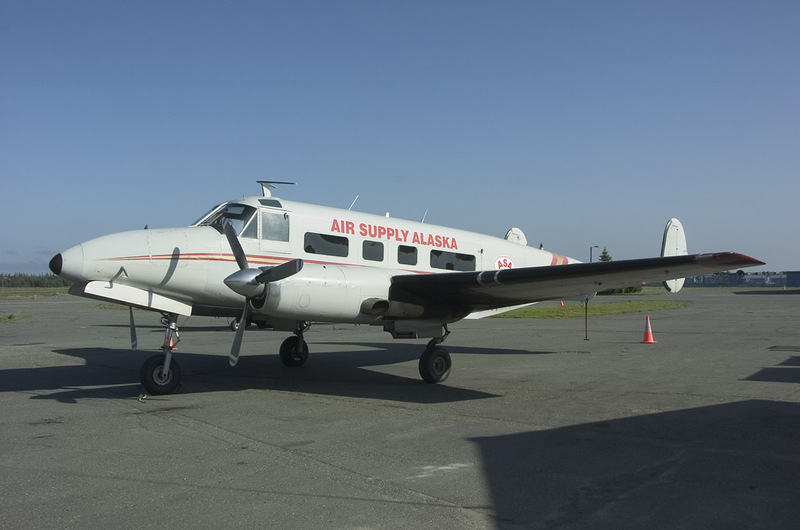 On arrival we disembarked and whilst the parcels were handed over to UPS we headed straight for some photos of an immaculate Volare of Air Supply Alaska to the amusement of the operator! 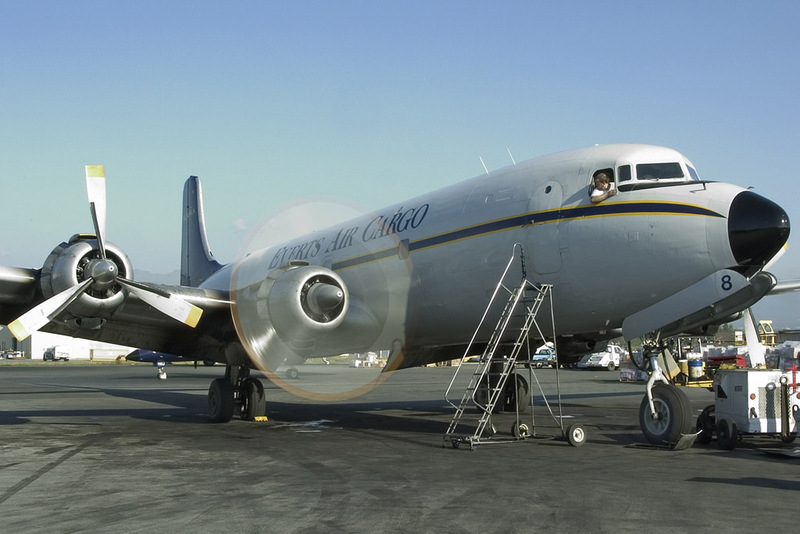 At this point our pilots had headed over to find out what we were up to and we told them that we were going to walk up to the Sixes at the other end of the ramp to which his response was "all aboard the DC-3 - I am going to taxi up there" so we all jumped aboard and promptly taxied to the Sixes. The owner of Universal had previously given his permission to photograph the aircraft and advised us that all three would be parked up until later in the day when they do evening fish runs. 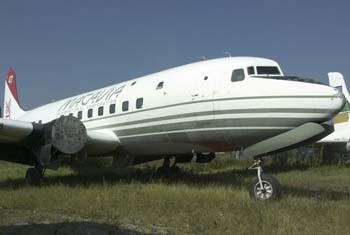 There were only two Sixes on the ramp both undergoing maintenance - one had an engine missing - which made both the aircraft look like they were going nowhere in a hurry. 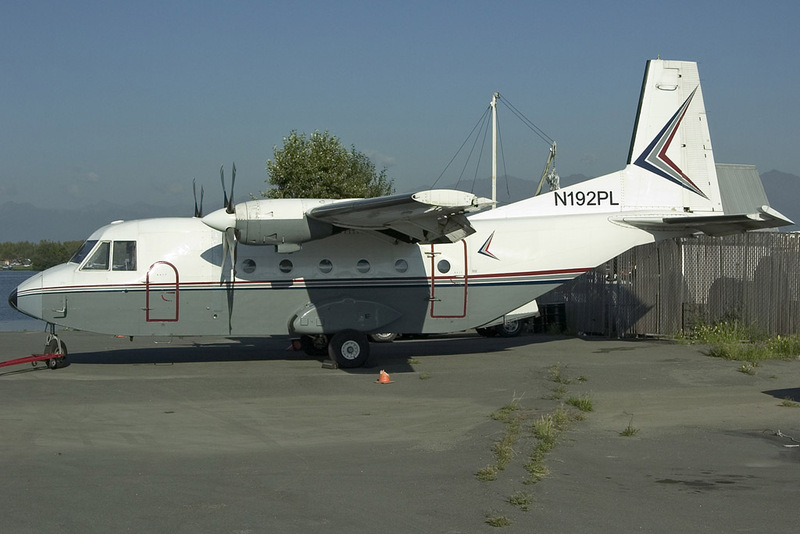 These aircraft were previously operated out in Texas and had moved to Alaska a year ago for more lucrative fish hauling duties. 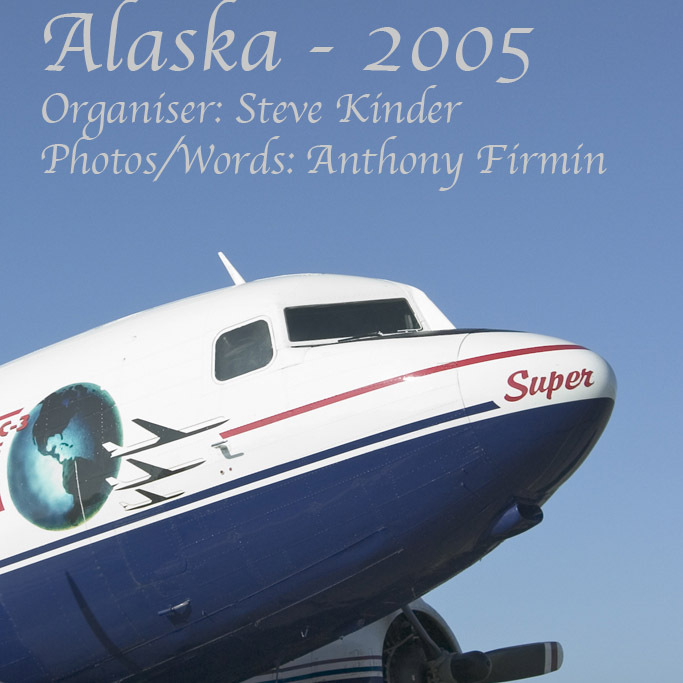 The party then reboarded the Super DC-3 and after take-off we made an approximately 180 degree right turn and headed North at 8000 feet for a relaxing 90 minute flight to Fairbanks. 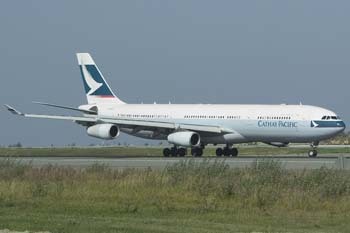 The aircraft is fitted out in an executive configuration - with 17 business class style seats to make it even more relaxing. Trans Northern use the aircraft primarily for shuttling tourists around as well as sightseeing and the occasional lucrative jobs for UPS. 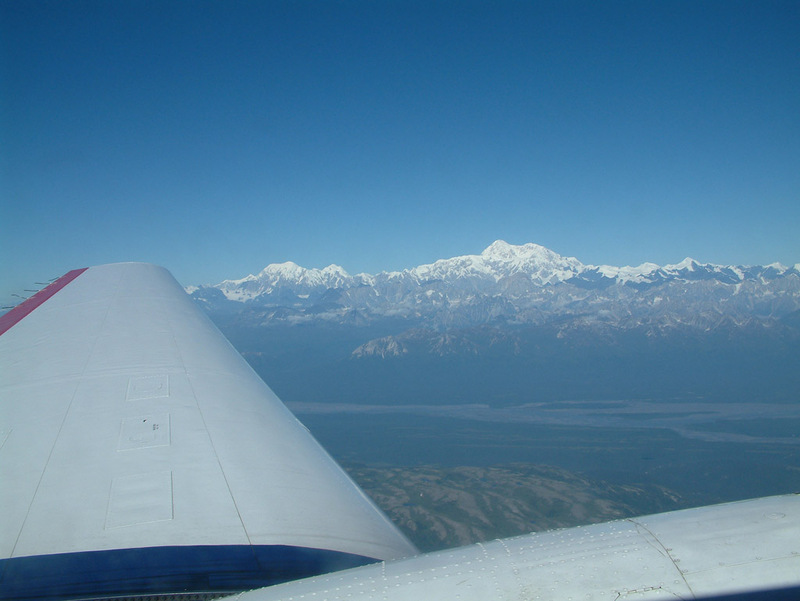 As well as absorbing the atmosphere of the flight, during this leg we were able to gain extraordinary views of Mount McKinley - one of the most prominent and impressive mountains in Alaska. Again, we had a straight in approach at Fairbanks for an effortlessly smooth landing where we subsequently taxied to the FBO and was met by the airports public relations manager. 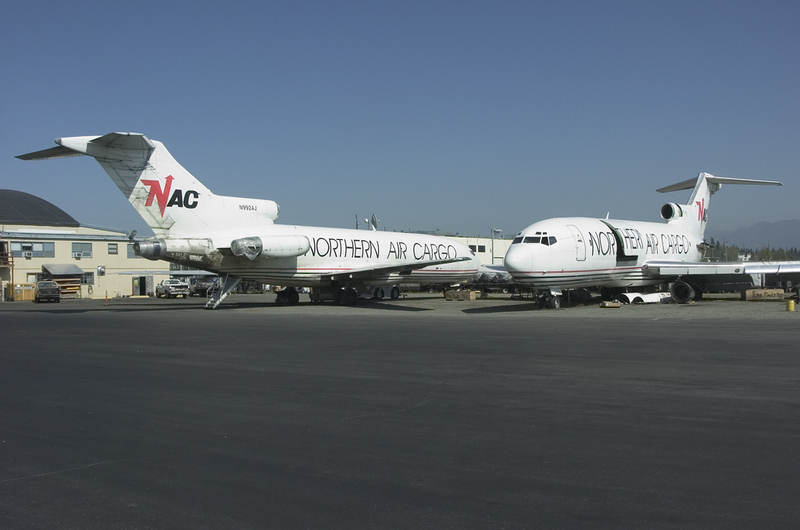 To one side of this ramp are the seven Northern Air Cargo DC-6's which have been retired here N79TA, N__06L, N__77K, N__36F, N__4TA, N__27N plus one frame that was unidentifiable. Around the corner and we were on Everts ramp - with plenty of active propliners! 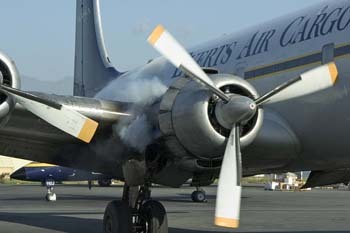 Our arrival had coincided with DC-6 N555SQ making a rather smokey start up and taxi out - wonderful stuff. The rest of the ramp was then toured after the Sixes departure giving us plenty of time to log and photograph the denizens including C-46's N1837M and N78488, DC-6's N351CE, N400UA and N7780B. Inside this hangar is a DC-6 simulator taken from the nose of a derelict airframe and fully restored - giving aircrew invaluable training opportunities. 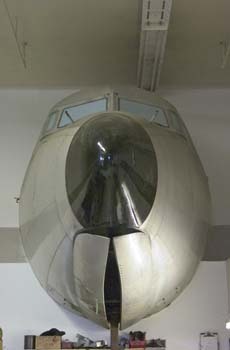 The simulator itself is nothing out of the ordinary but the front of the airframe has also been fully restored and is ominously positioned in one of the workshops looking like it has just crashed through the wall - very impressive! 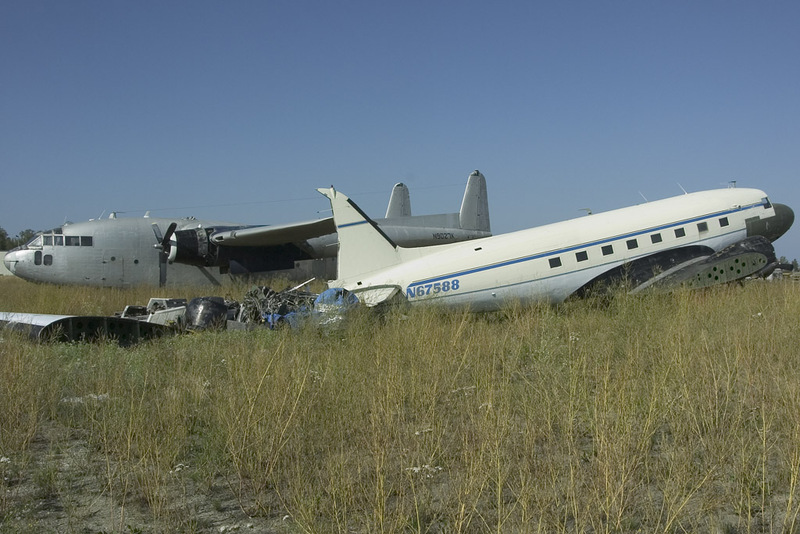 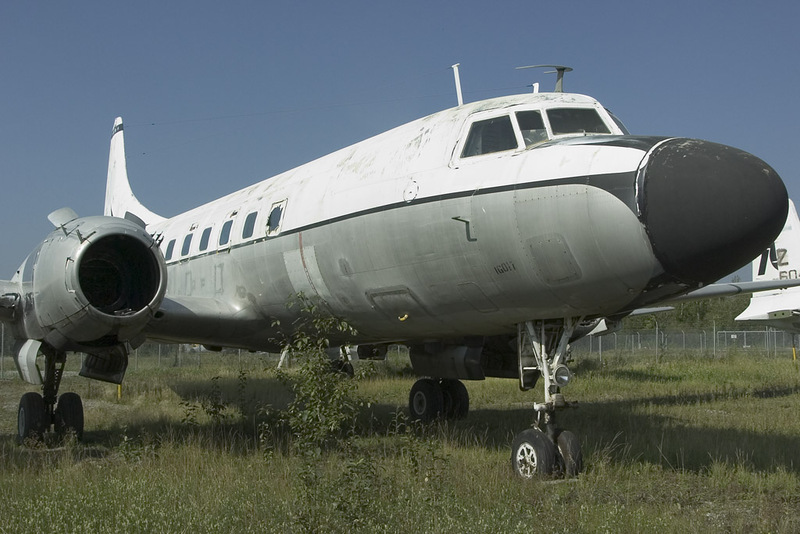 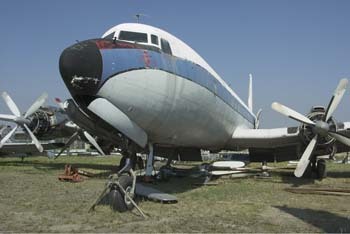 Time was also spent touring Everts "boneyard" with its collection of Convairs, DC-6's and C-46's as well as their landside compounds with albeit less intact airframes. These contained C-46's including an ex-JASDF example and DC-6's including one from Trans Continental as well as a number of HH-120's. 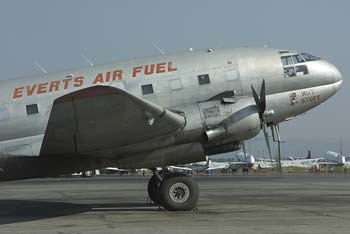 Back airside and the first stop was Brookes Air Fuel - unfortunately both their Carvair and "new" DC-4 were out earning money. 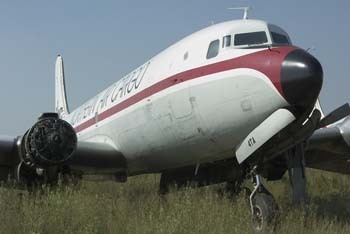 We were advised that the Carvair was due back imminently but sadly didn't arrive during our visit. Moving swiftly on to visit Everts other maintenance hangar and the face of things to come!! 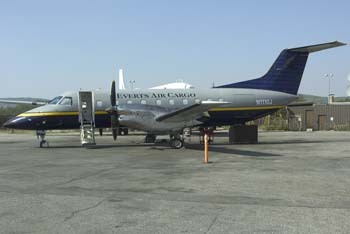 Here were a couple of ex-United Express Embraer 120's - ideal for smaller payloads and smaller strips. They may not have the heritage of the Sixes and Commando's, but, they are "start and go" aircraft that are much more reliable. 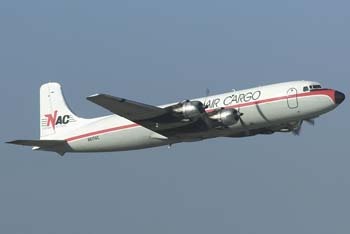 Their older cousins may have more capacity and owe the companies very little having been bought at low prices - the only major cost being maintenance. 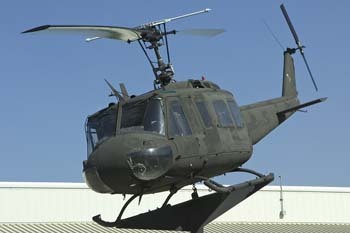 Less is maintenance is required of more modern aircraft giving them more time in the air making them more cost effective. 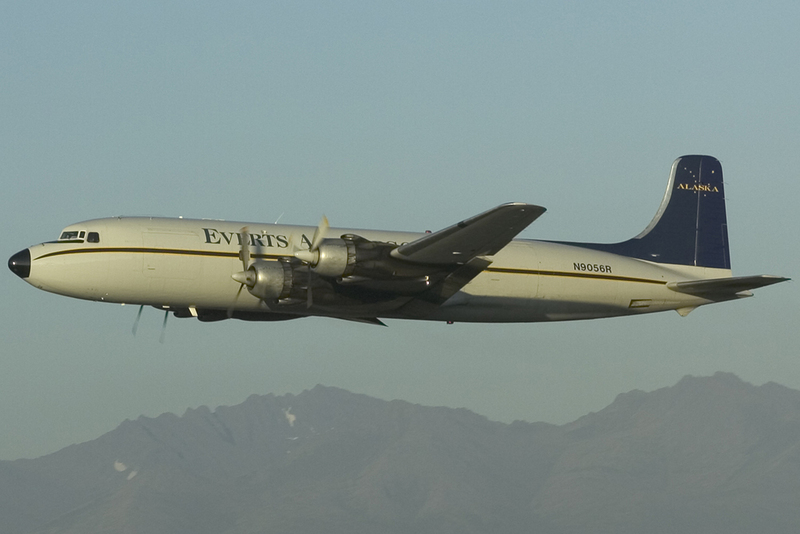 Evert's operate a published schedule of cargo flights so operating reliable aircraft helps them provide their customers with a more consistent service. 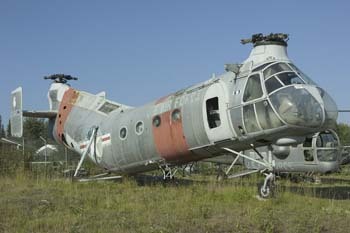 With the possibilities of modern aircraft coming on line doesn't mean the end of the line just yet for the old propliners. 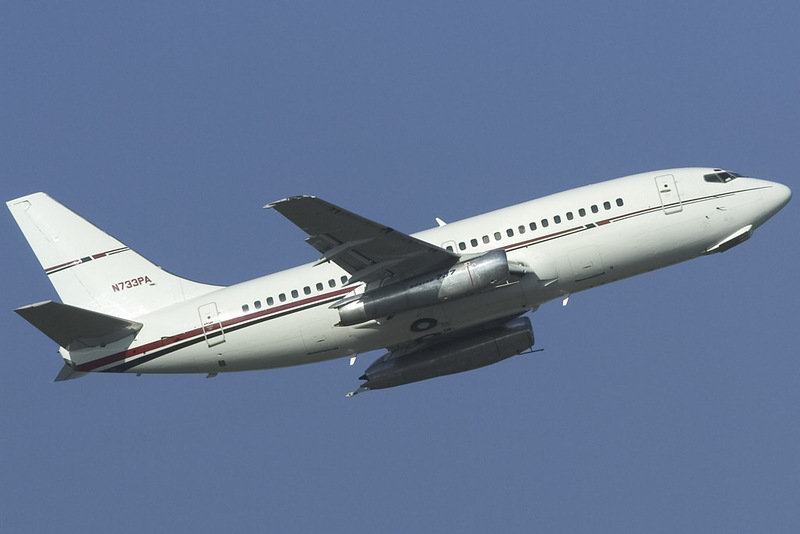 Evert are still looking to purchase DC-6's as there are some operations that still lend themselves to this type of aircraft - some diamond drill bits for the oil industry are too heavy for the Sixes. They even have an exhaustive list of items that they will carry with a quite a hefty surcharge, this interestingly includes aircraft wings! 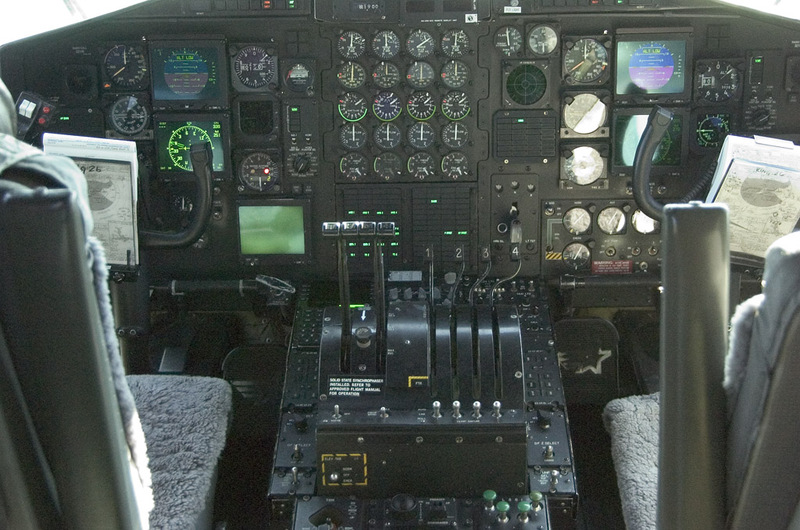 Even though Alaska is a oil rich US state, getting fuel around to isolated and remote areas is a major part of Evert's and Northern Air's work and they have several aircraft converted specifically for this role and this is potentially dangerous work too. 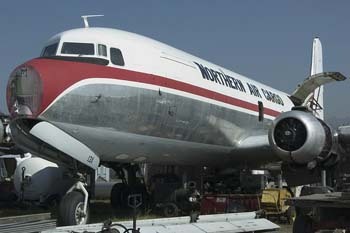 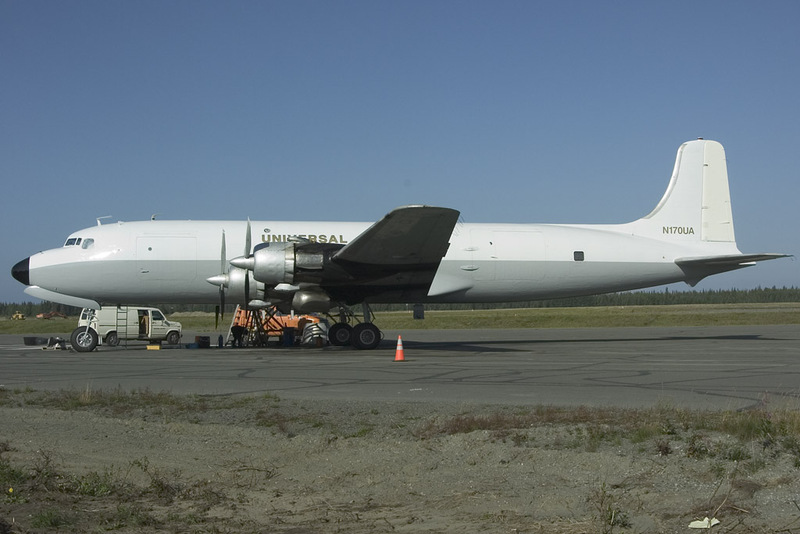 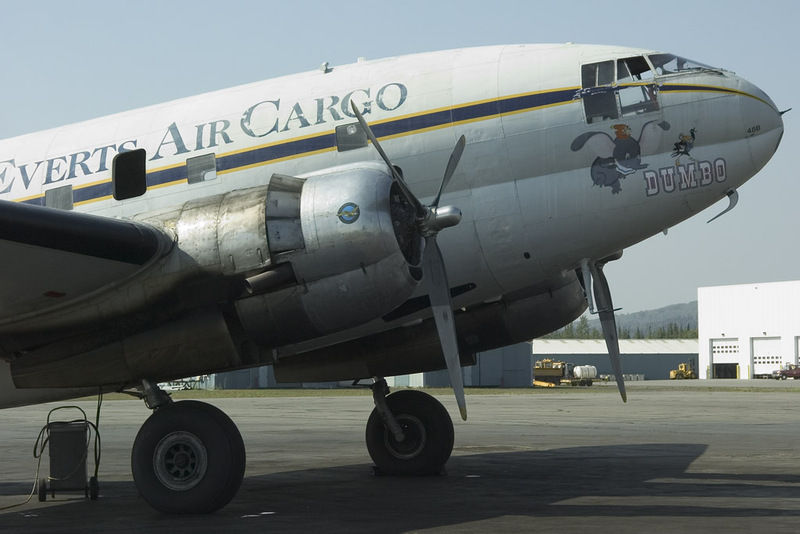 Northern Air Fuels have DC-6's N7780B and N7919C stationed at Fairbanks for this purpose while Evert's have C-46 N1837M. 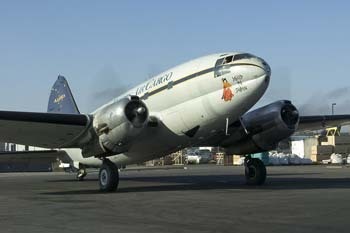 So after what seemed an all to quick tour it was back aboard the Super DC-3 for our flight back to Anchorage. 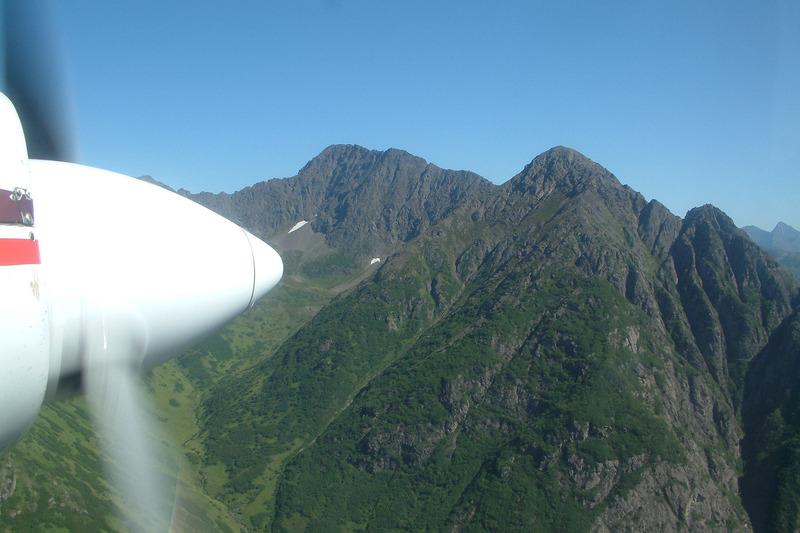 The return flight still took the best part of 90 minutes but was at the much lower level of 1200 feet - the view of the Alaskan scenery as a result of this lower altitude was simply stunning. 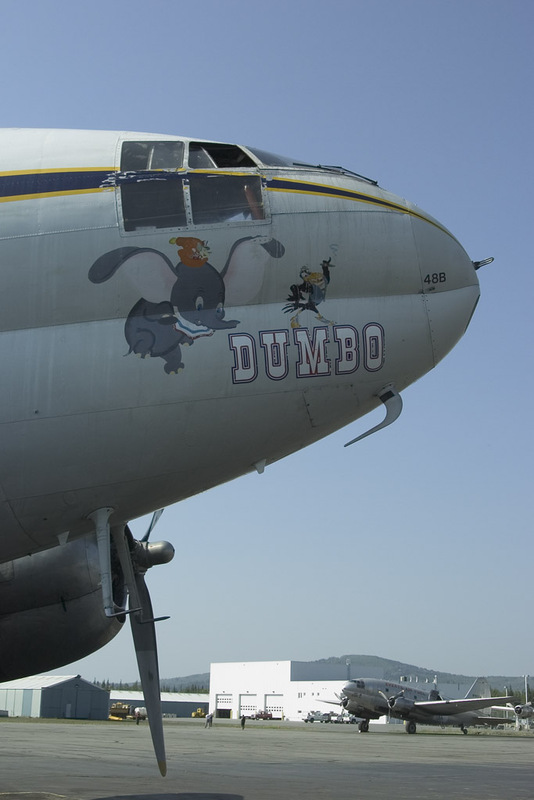 There was more than one occasion when it was though that we might have to go and buy a can of Dulux afterwards to do a bit of touching up - w e were that close - but it was still very exhilarating. The approach back into Anchorage was equally as interesting approaching from the north east of the airfield we flew anti-clockwise around the outside of the airfield in a steady turn until a sharp turn took us on finals for runway 32 and literally seconds later we had touched down - real seat of your pants flying. 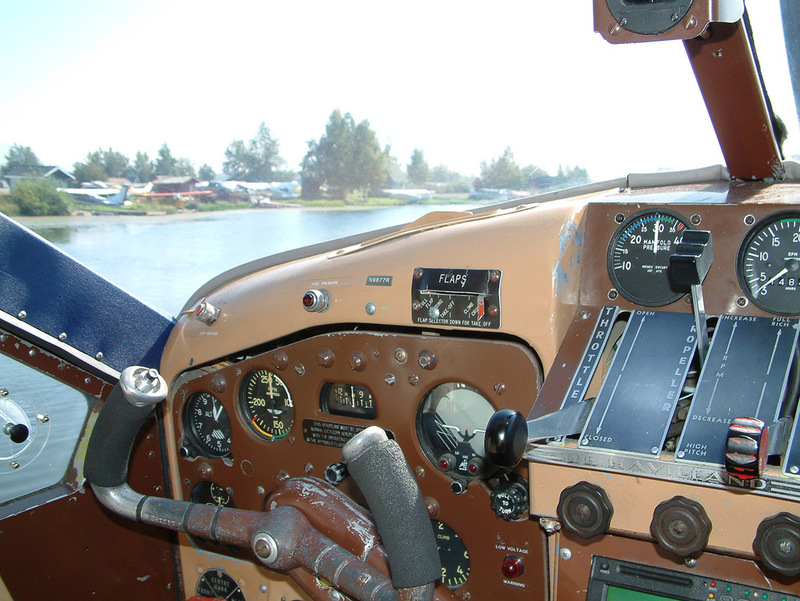 An excellent day out in a relatively rare aircraft! 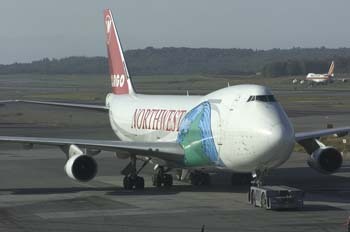 Back at Anchorage we decided to make a visit to Northern Air cargo's ramp. 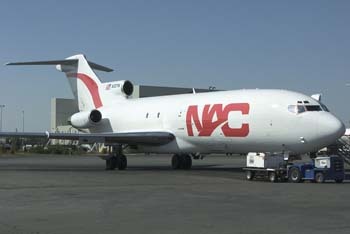 Again, progress already started here sometime ago when the Boeing 727 entered service, although several examples of these have now been retired and used for spares, and whilst this is a proven excellent hauler it requires runways of a certain standard and length limiting its use. So enter the ATR-42. 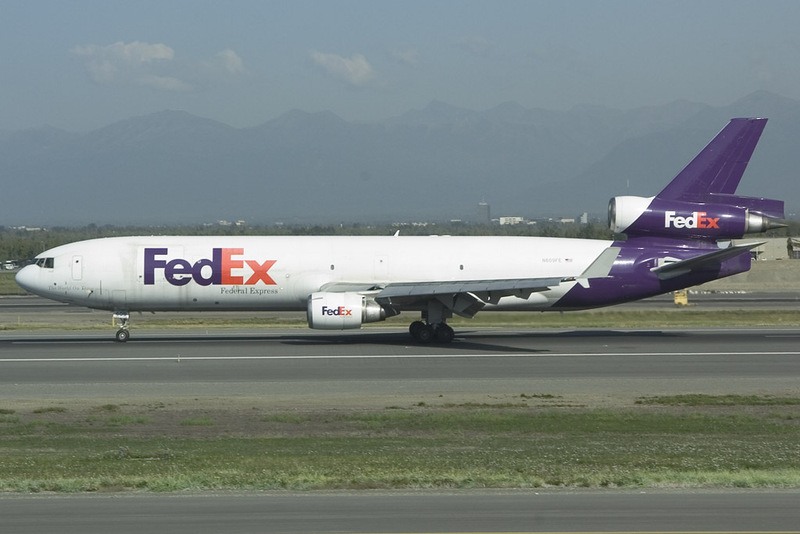 As many airlines are upgrading their commuter fleets from ATR's and Brasilia's to CRJ's and 135/145's there is once again a surplus of aircraft with STOL ability that can haul freight, is economic to run and aren't going to require large amounts of maintenance prior to every flight. 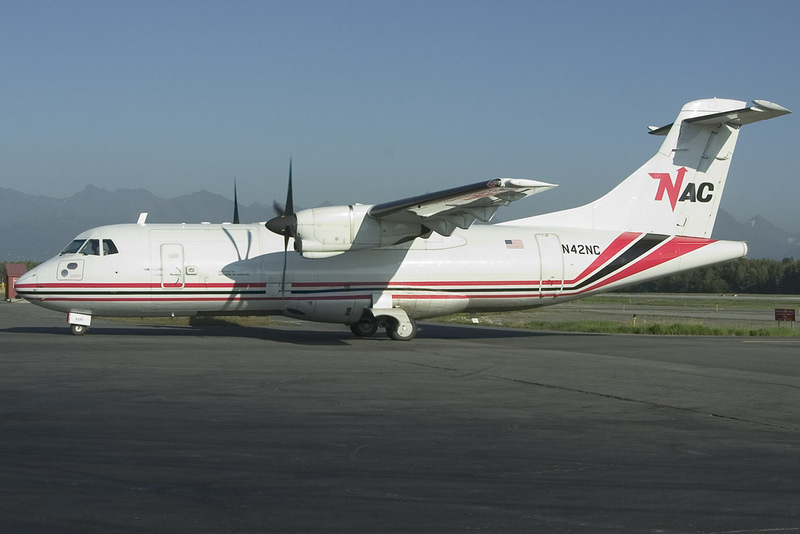 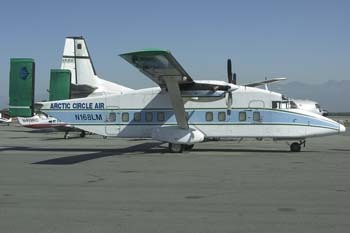 Northern Air Cargo have introduced the ATR in Alaska with their first example N42NC. The ground crews were, initially, not particularly happy with this piece of French hardware - but the aircrafts plus points are now winning them around. 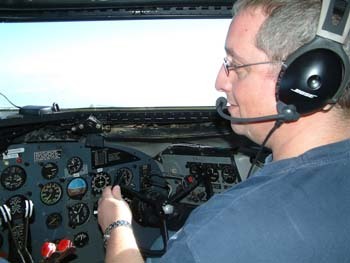 The pilots only comment was "its not a Six!". 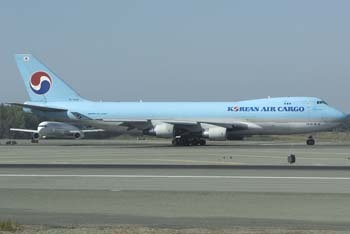 The rest of the day was spent a the end of runway 32 with some exceptional opportunities for photographing the departing aircraft. 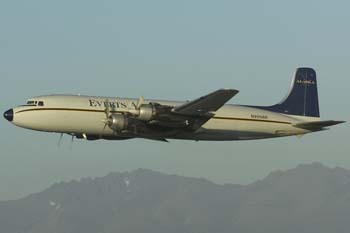 We were even treated to one of Everts DC-6's making a late take-off in the glorious late evening sunset. With the long sunsets in this part of the world aviation photography certainly becomes more atmospheric. 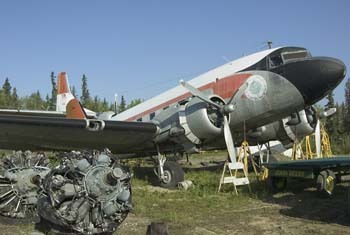 The following day involved an hours drive North of Anchorage to Wasilla to visit the Transportation Museum of Alaska. This museum covers the whole spectrum of transport with a number of trains, cars, trucks, bicycles and a few aeroplanes representing past military involvement in Alaska including a C-47, an F-104 and several helicopters. 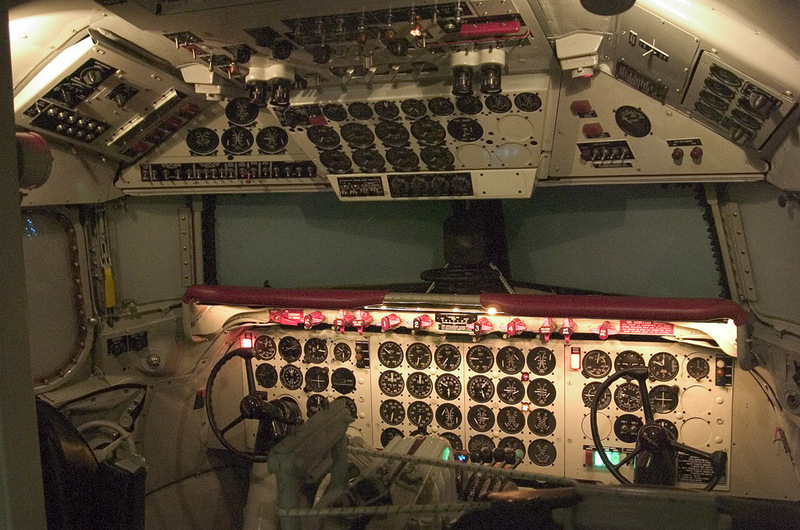 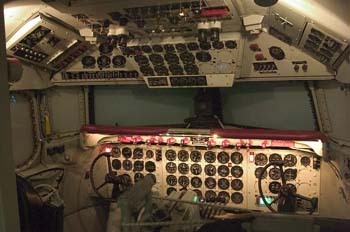 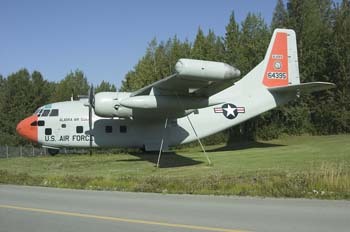 The museum also has a C-123 and a DC-3 previously operated by the FAA. A twenty minute drive later and we were at Palmer Municipal - home to a couple of Fairchild C-119's, N8501W and N_____ operated by xxxxxxxxxxxxxx. These aircraft are airworthy and available for freight charters - although the owner didn't think that they would be doing any work any time soon. 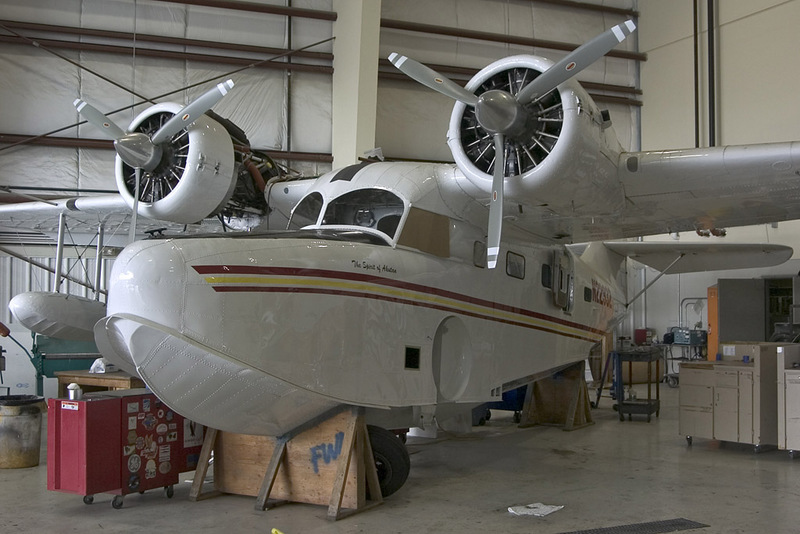 One of the aircraft has an engine missing which is currently undergoing an overhaul - but he expects both aircraft to be fully operational and to be earning their keep next year. 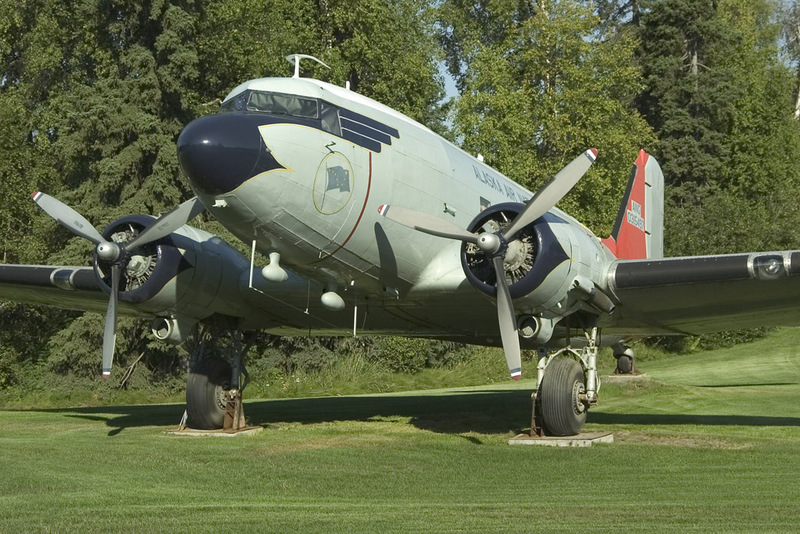 Other residents of Palmer include a pair DC-3's - N50CM and N59314 operated by Woods Air Service. Unfortunately these aircraft were damaged in a sandstorm earlier in the year and their fate is currently unknown although the general consensus is that they are unlikely to fly again. 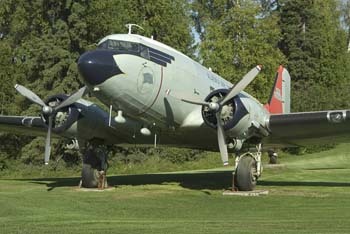 Also present was an immaculate DC-3 freighter - N305SF. 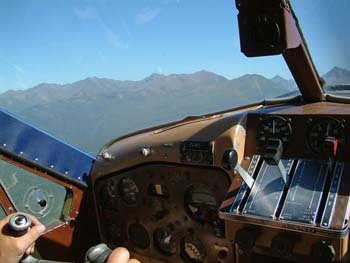 Several of the party undertook also some pleasure flying here in a C172 to view a couple of B-29 Superfortress wrecks one of which was still relatively intact probably due to its remoteness making souvenir hunters a rarity! 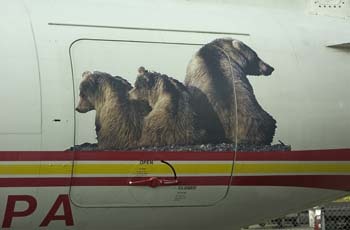 The pilots skills were, apparently, impressive! 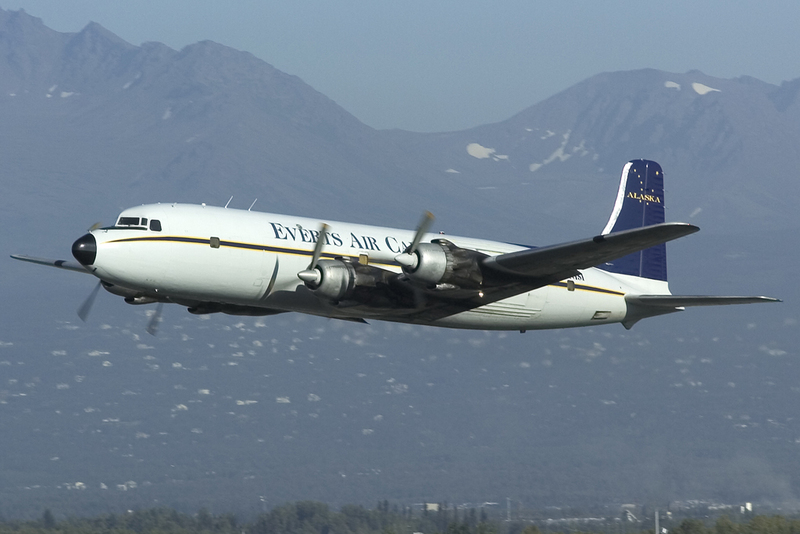 Returning to Anchorage time was again spent at the raised area to the west of runway 32 to get some great action shots of aircraft taking off including another Evert's DC-6 - this time running to schedule. Times have changed considerably and the majority of movements at Anchorage are now freighters. 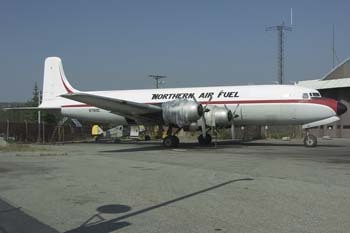 From the early days of intercontinental air travel through to the early nineties Anchorage was a busy fuel stop point for most airlines. 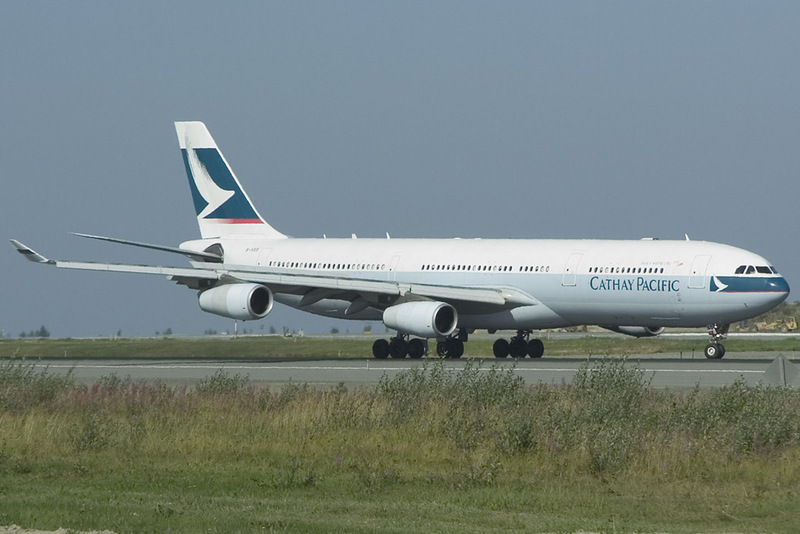 With the introduction of aircraft like the 747-400, 777, and A330/340 airlines were able to fly non-stop across the Pacific making stops at ANC redundant. 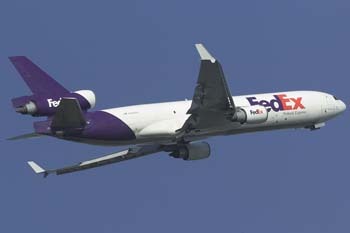 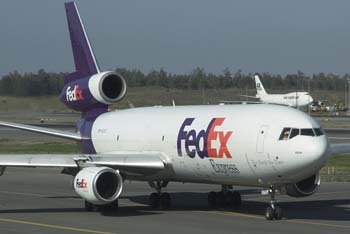 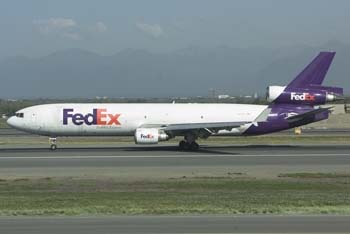 From the late nineties the airport had to re-invent itself initially developing as major hubs for parcel giants FedEx (DC-10 and MD-11) and UPS (747, 767 and MD-11). The airport also sold itself as a stopping point for more modern freighters for refueling and crew changes. 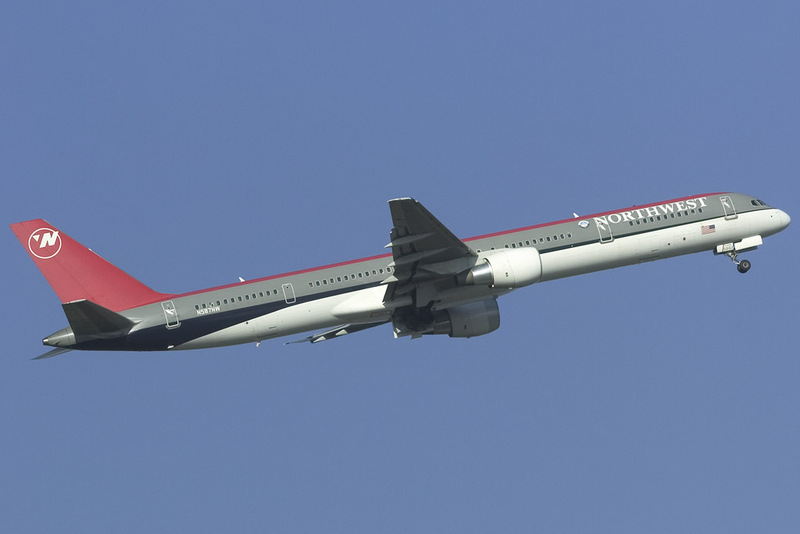 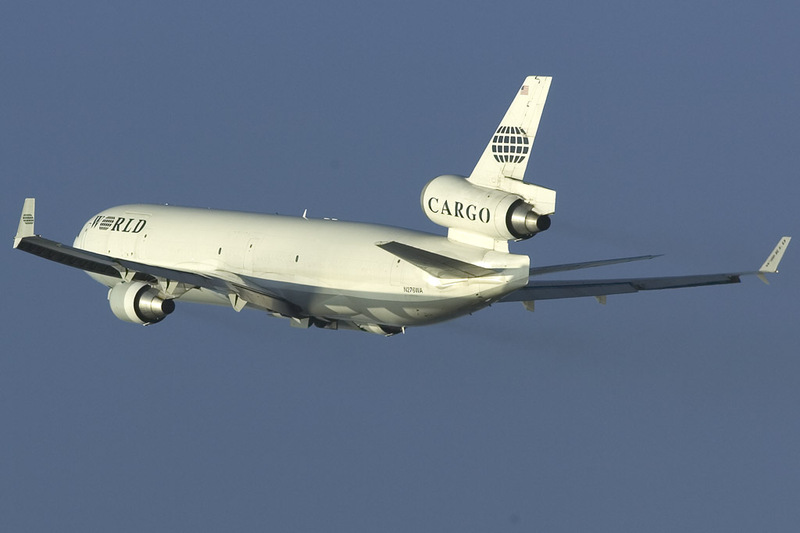 Even though the aircraft could technically fly non-stop taking on less fuel allows for more freight to carried which appealed to many of the far-eastern airlines. 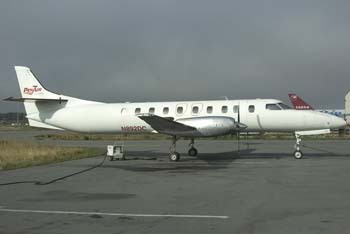 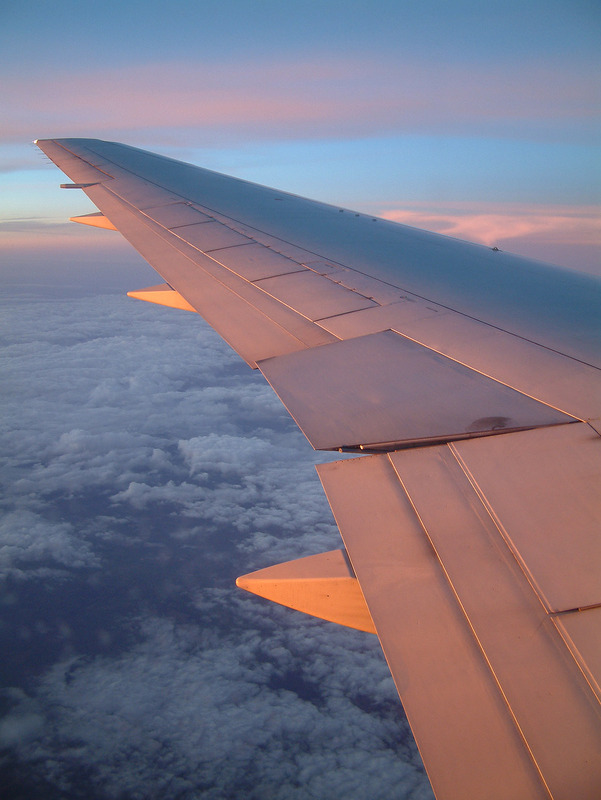 The aircraft are allowed to stop for up to two hours for fuelling and a crew change after which additional charges apply. 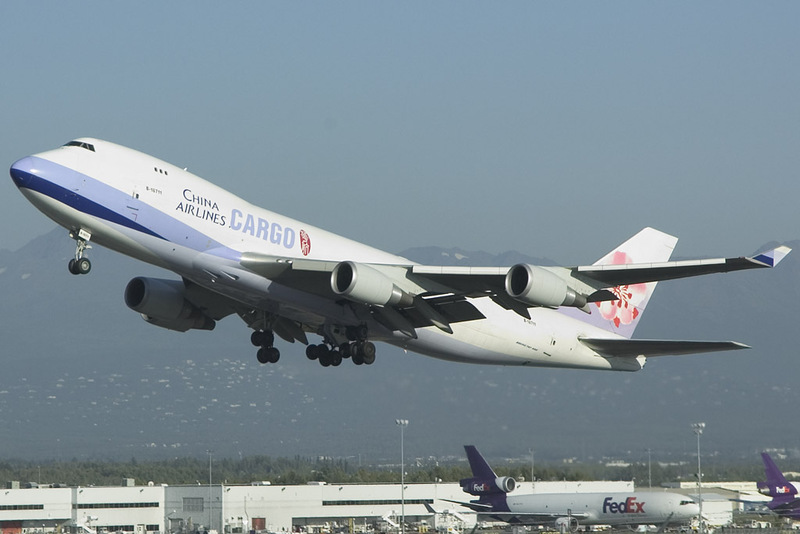 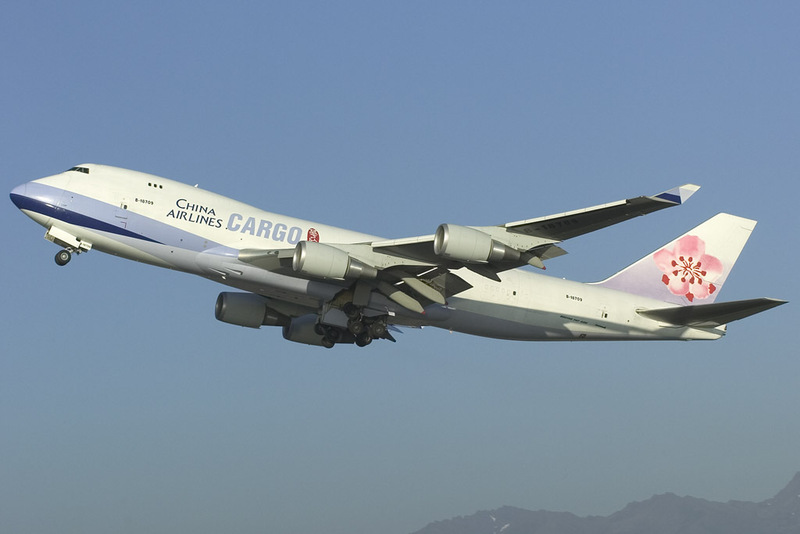 China Airlines Cargo have up to eight flights a day into ANC transiting to/from the "lower 48". 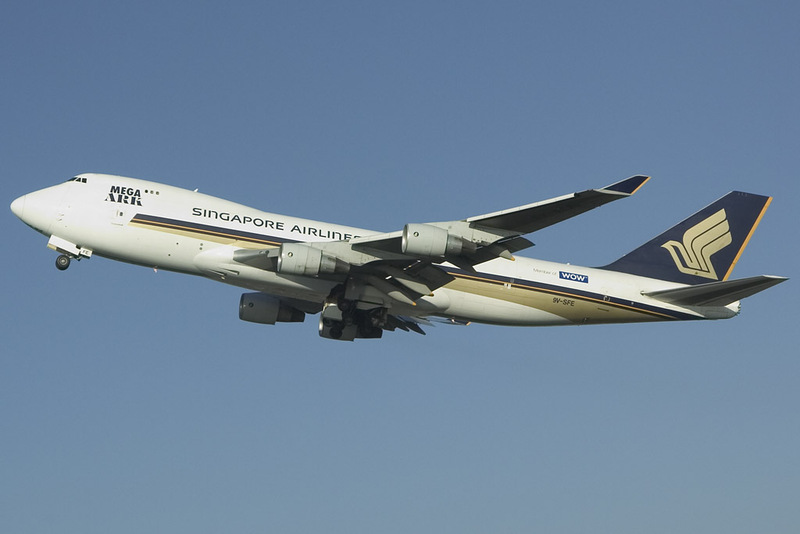 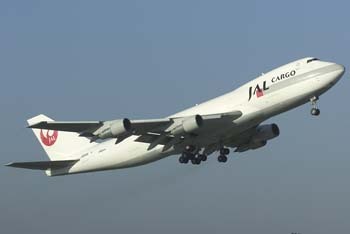 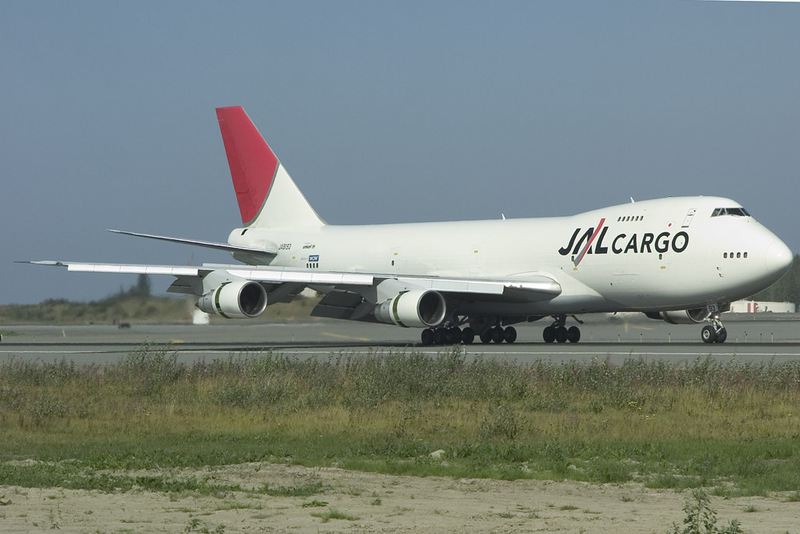 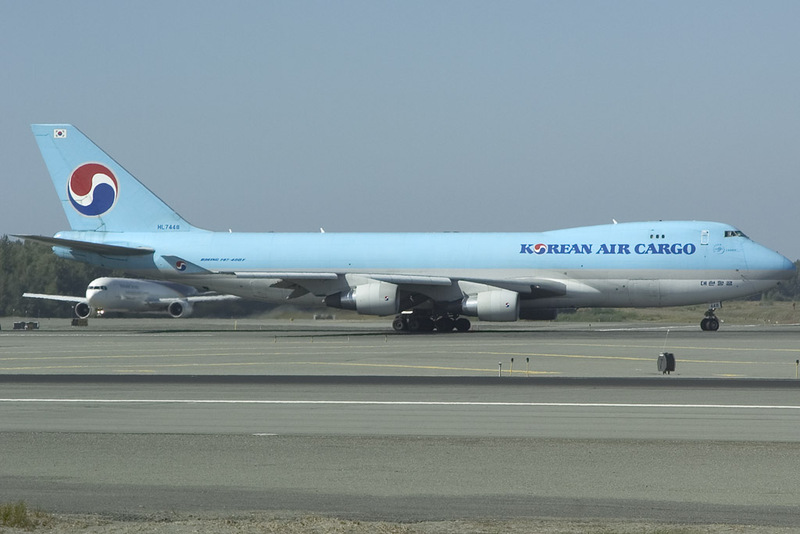 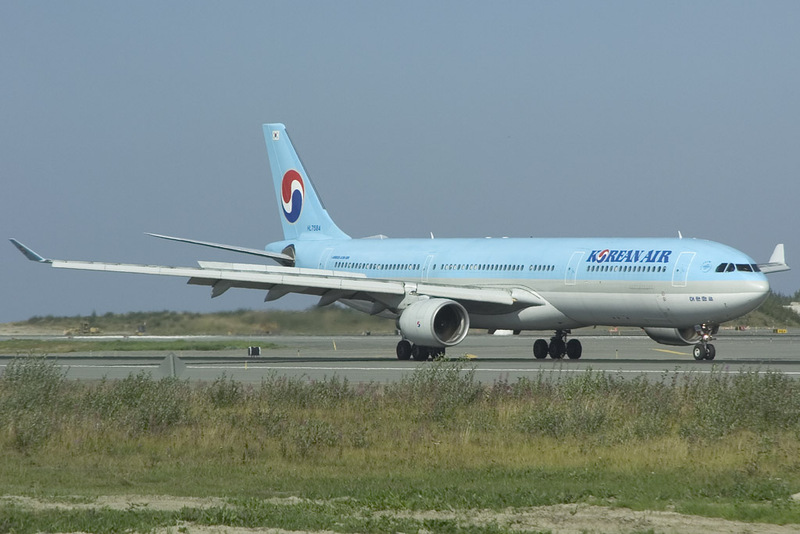 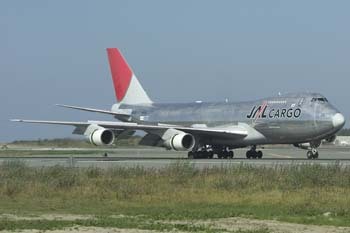 Other carriers transiting through include JAL Cargo, Korean A ir Cargo, Nippon Cargo Airlines, Eva Air Cargo, World Airlines Cargo, Singapore Airlines Cargo, Tradewinds, Kallita and China Southern Cargo. 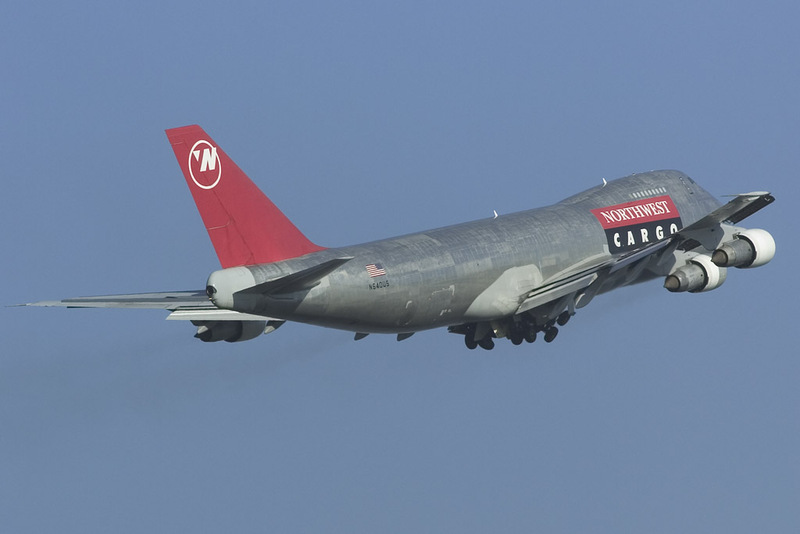 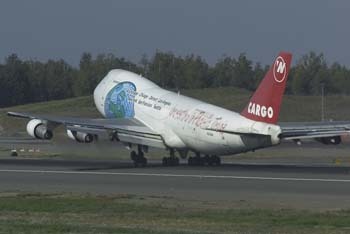 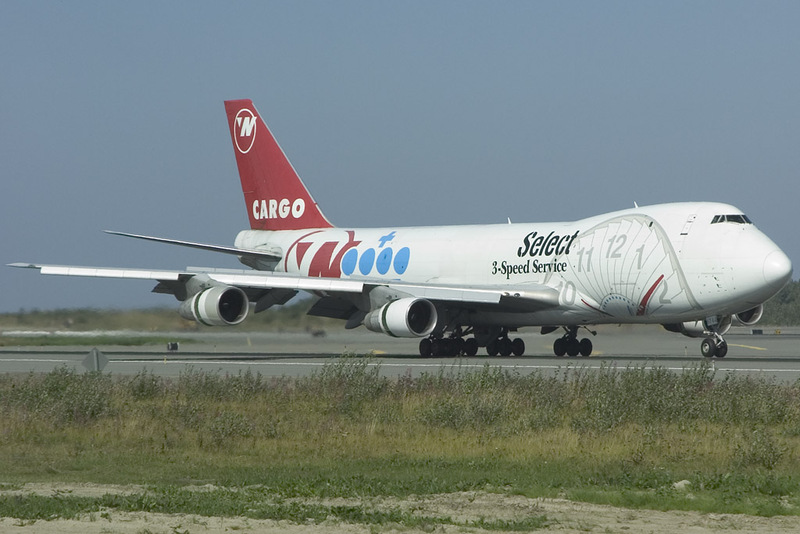 Northwest Airlines Cargo also have a small hub with up to six flights a day. 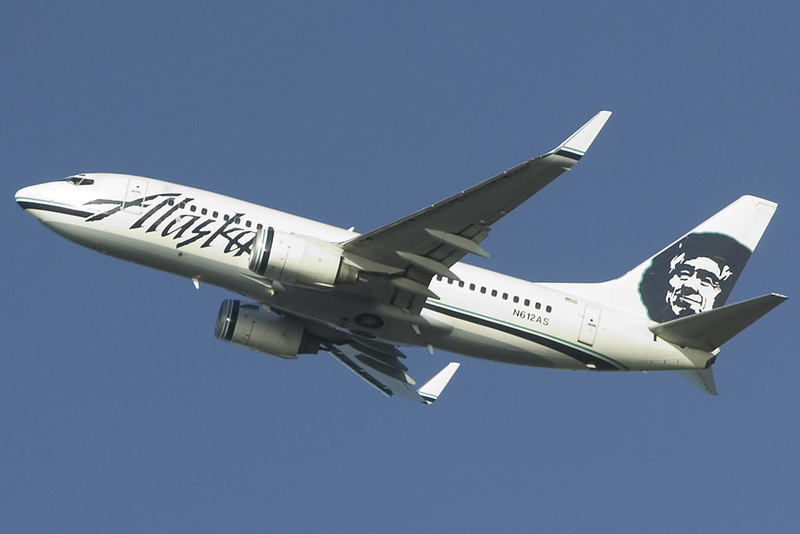 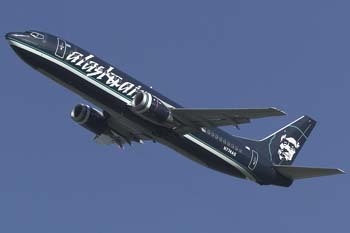 Alaskan Airlines are the biggest passenger carrying airline here but many would be surprised by the relatively low number of flights they have, the most common aircraft being the 737-200QC which is no longer seen in the "lower 48". 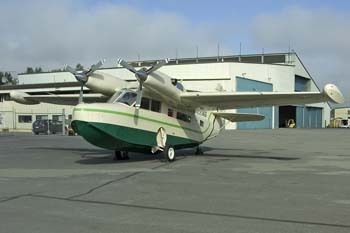 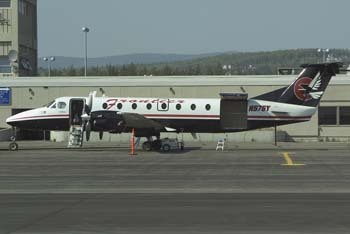 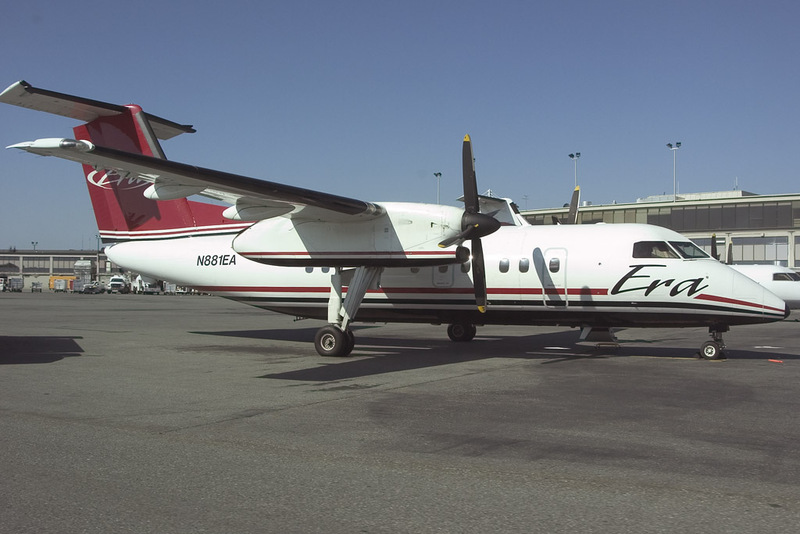 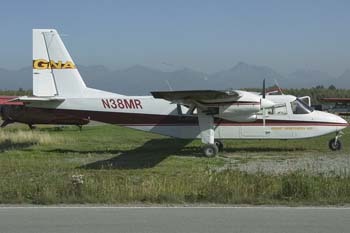 Era provide the commuter connections for Alaskan with a mix of D-8's, Be1900's and Twin Otters. 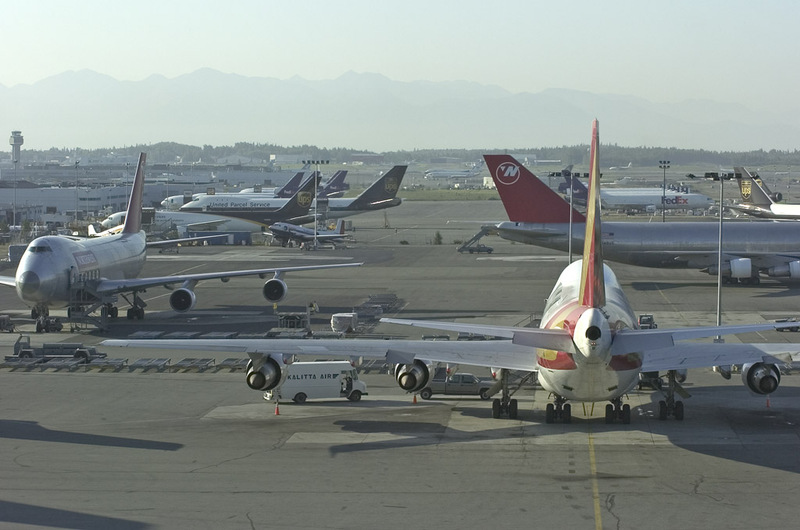 The main US carriers are all represented - American, Continental, Delta, Northwest and United - with three to four flights each per day serving their main hubs. Next to Anchorage is Lake Hood - this is technically two airfields with the Lake for the sea plane base having one designator, LHD, whilst the gravel strip has the designator Z41. 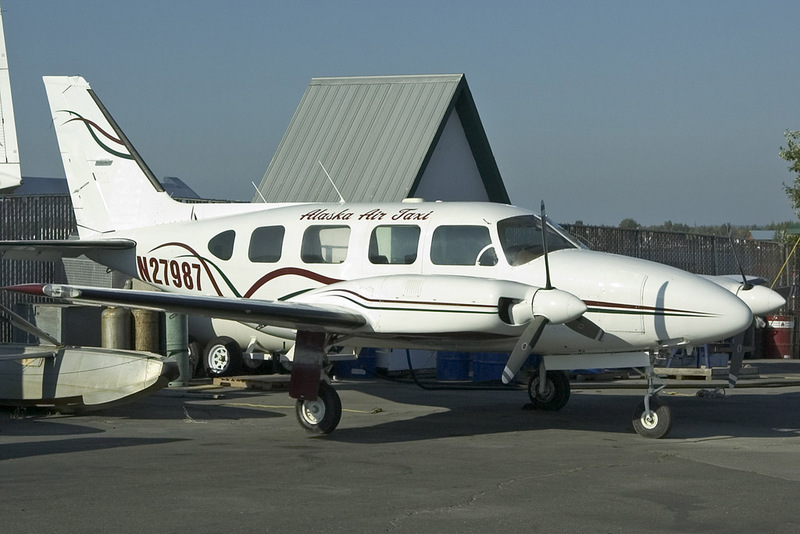 ANC and the two Lake Hood 's are physically connected by a taxi-way which goes over the perimeter road allowing access to the main airports runway for larger or heavier aircraft that aren't able to use the strips gravel runway; they are logically connected by using the same control tower albeit each "airfield" uses separate frequencies. 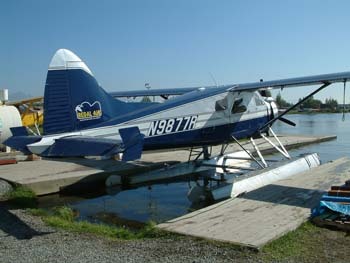 Lake Hood has an interesting selection of aircraft and operators. 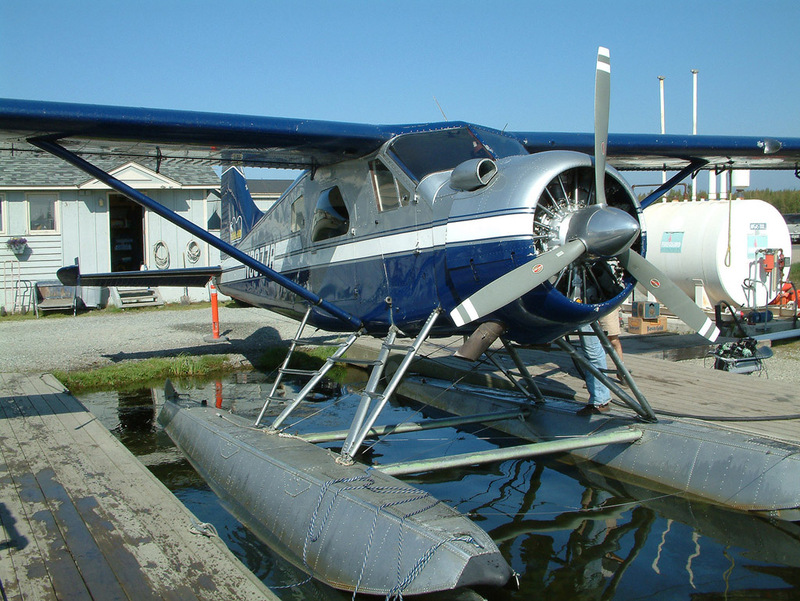 Within the seaplane base there a large number of single engine Cessna's on floats but also Beavers and Otters, along with their respective turbo conversions, all lovingly looked after. 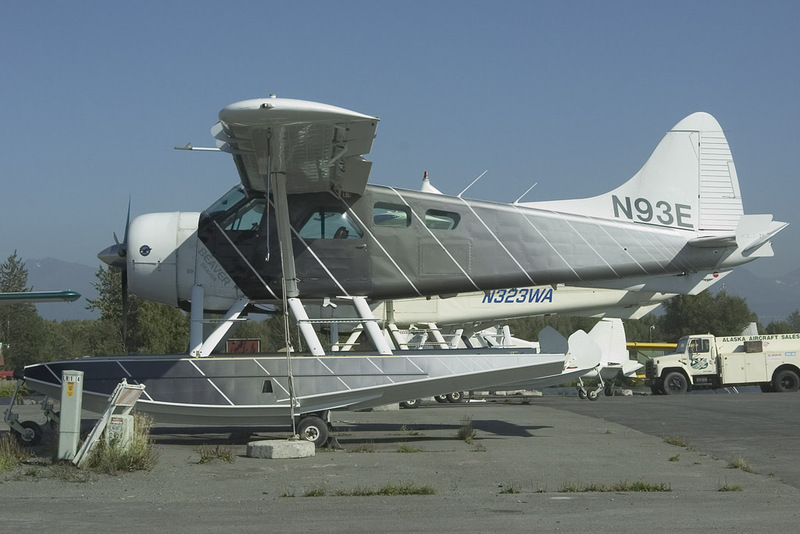 Other more interesting, non-amphibious denizens of Lake Hood include an Islander and a Skyvan. 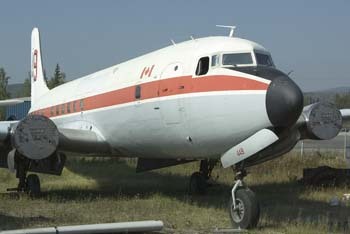 Another rather rare resident is a Fairchild 24, named the Argus in Europe. Air Taxi companies at Lake Hood provide vital links to outlying areas in the winter, and boost their incomes in the summer, by flying tourists around on hunting and fishing trips. 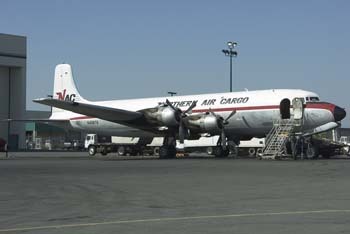 During our visit Regal Air were preparing a flight out to one party at a remote lodge to take extra supplies which consisted of several large crates of Bud and Miller - as well as a little extra food!! 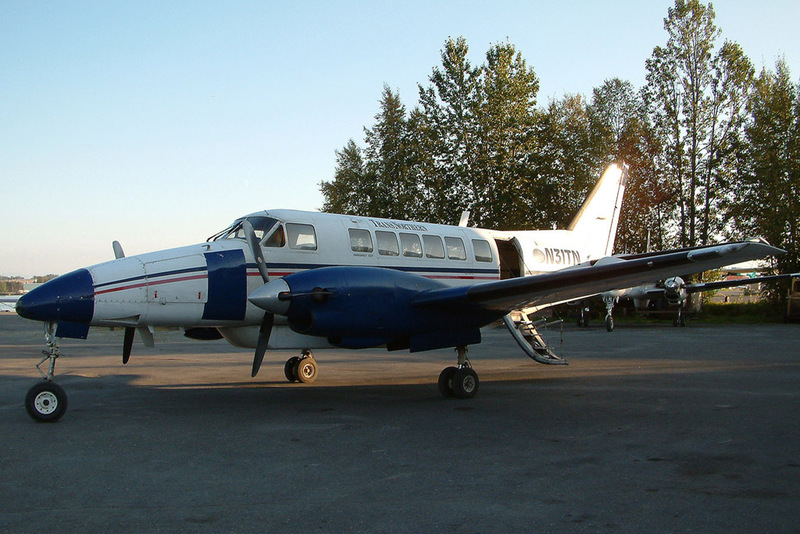 Another vacationing party also returned and twenty bags full of whole salmon were removed from the interior of one of the floats - an interesting use of extra cargo space especially when you see all the bags the Americans like to take with them!! 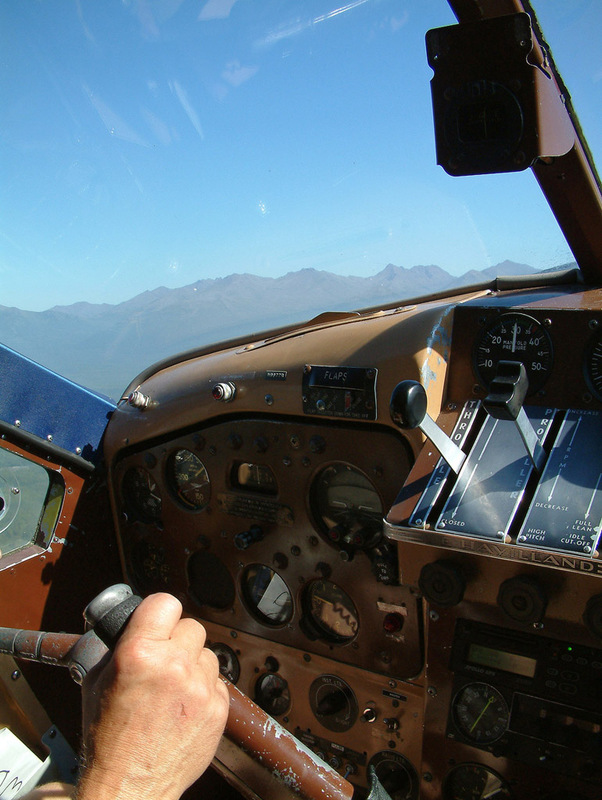 Alaska has the largest per capita ownership of aircraft and holders of private pilots licences of anywhere in the USA, and possibly the world, mainly due to the inhospitable region making access by vehicle either long winded or impossible. With hundreds of light aircraft at Lake Hood and over 2000 at the downtown airport, Merrill Field, as well as large numbers in other parts of the state is difficult to comprehend when considering the size of their cities! 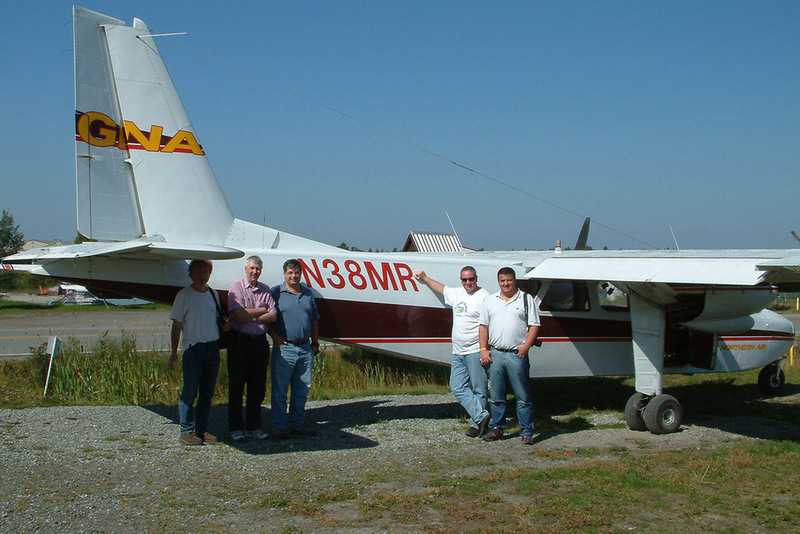 The general aviation scene here, unlike other parts of the USA, is very healthy - because for many it is a necessary. The following morning we had heard that there was going to be a Northern Air Cargo DC-6 departure so it was back to the airport taking up residence on the opposite side of runway 32 for more fantastic photographic opportunities - even though some of the movements were starting to become a little repetitive. 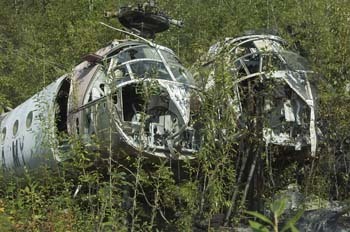 We had a tour of Kulis ANG base booked for 10:00 and it was getting awfully close to the time of the tour. 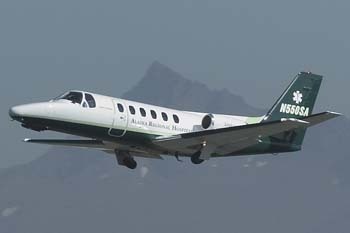 We watched the Six, N6174C, taxi out but then held for what seemed like an eternity before making an gentle low take-off with smoke pouring from her four radial Pratt & Whitney engines. After a mad dash around to the other side of the airfield we were warmly welcomed by the Public Relations officer for Kulis who oragnised an excellent tour for us. 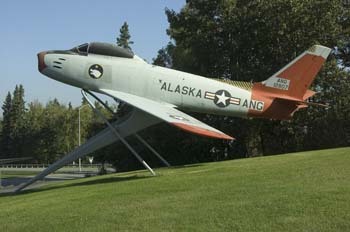 First we visited all the preserved aircraft including the F-88 which was flown by Albert Kulis of whom the base is named. 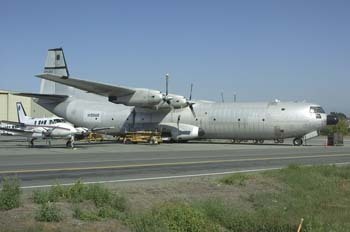 We then moved out onto the main ramp where the C-130's reside and were taken around to photograph every aircraft. 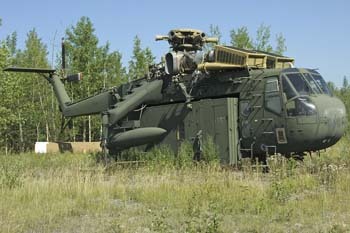 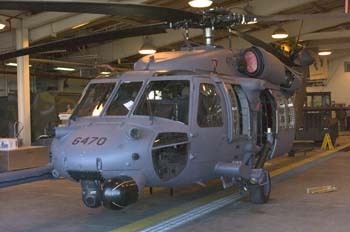 Most of the UH-60's were hangared but there were a couple of examples outside to keep our cameras busy. The unit operates a mix of fixed wing and rotary aircraft - two squadrons of UH-60's and a squadron of C-130's - the ANG couldn't have been more accommodating! 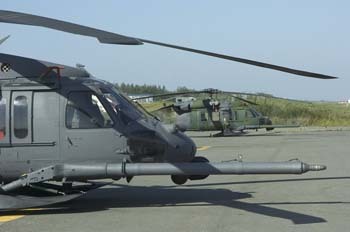 The primary mission of the ANG is search and rescue with the aircraft currently undergoing a modification program of avionics and sensors. 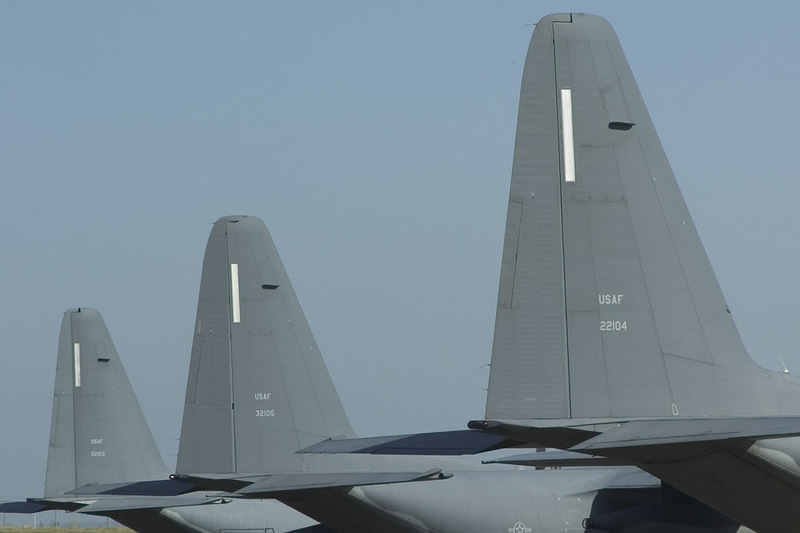 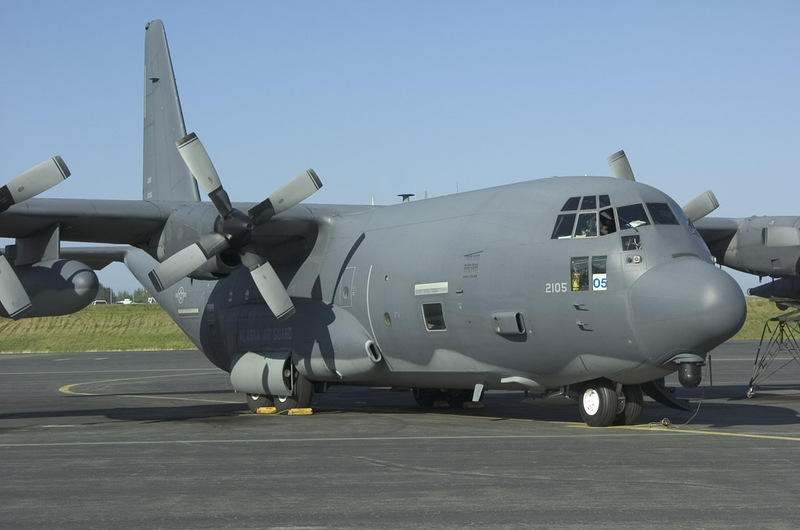 There had been talk of the unit upgrading to C-130J's but with the current mod program starting to get going this is now unlikely in the short to medium term. 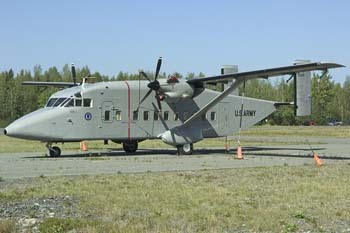 Shortly after our visit the Alaksa ANG were departing for a TDY to Iraq. 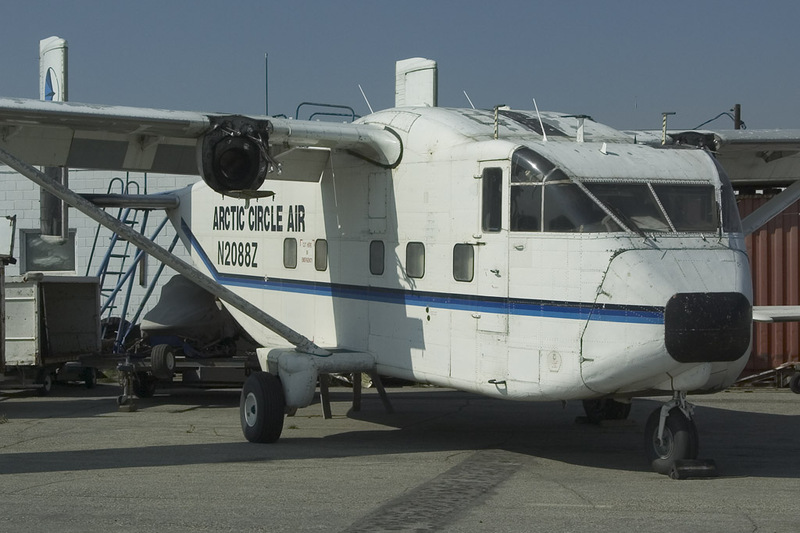 Fully expecting that the units would be primarily used for flying sorties in Artic conditions I was surprised to learn that in the Northern Alaska is a desert with conditions similar to those found in the middle east - Alaska proving to be an ideal training ground for many climate extremes. Returning to Lake Hood it was time for another of our special charters - an Islander of Great Northern Air - for an hour long flight around the mountains immediately to the east of Anchorage, taking off and landing on Lake Hoods gravel strip and making a dual approach with a floated Cessna which was landing on the Lake! 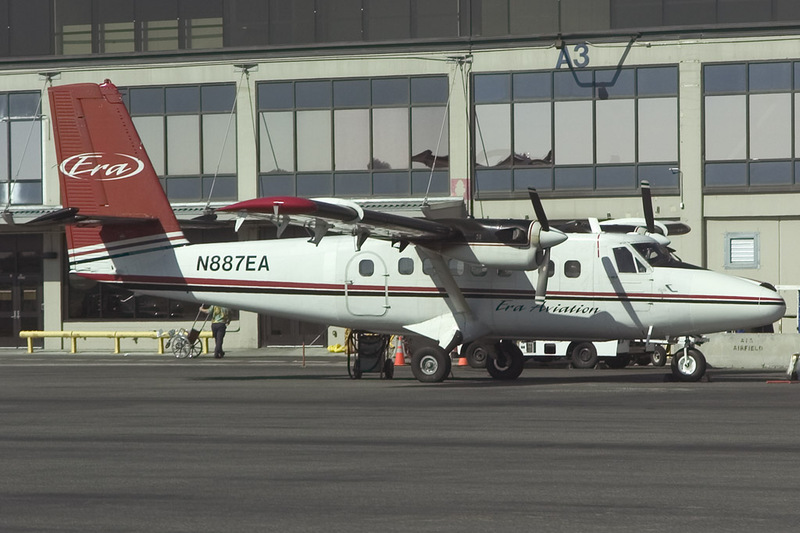 Returning to the terminal we meet up with the rest of the party for our ramp tour of Ted Stevens International. With the heightened security situation in the USA, and especially at US airports, we realized how lucky we were to be treated this way - in some ways everywhere we visited in Alaska had a much more relaxed pre-9/11 feel to it. 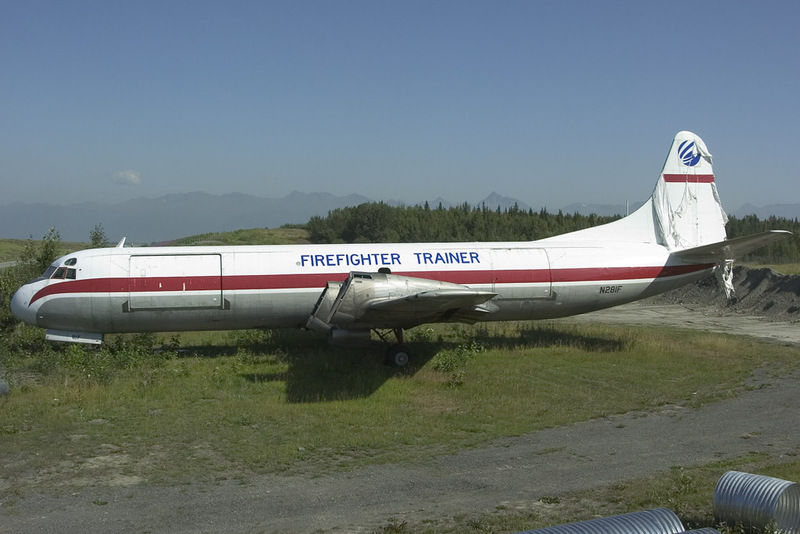 This gave us the opportunity to photograph some more "highlights" including a C-133, a couple more DC-3's and the L-188 Electra used by the fire service as a trainer and can only be briefly seen when landing on runway 17. 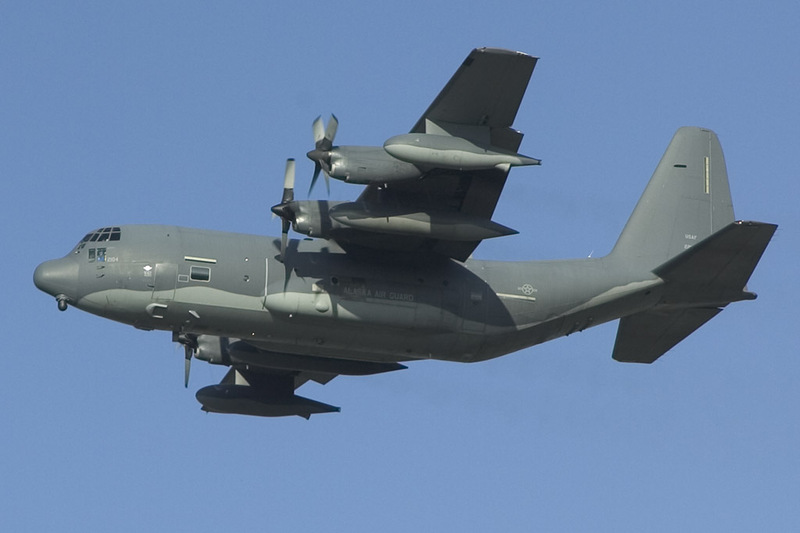 Time was then spent on higher ground inside the perimeter for some more awesome photographs being even closer to the aircraft - it really is difficult to bad photographs here! 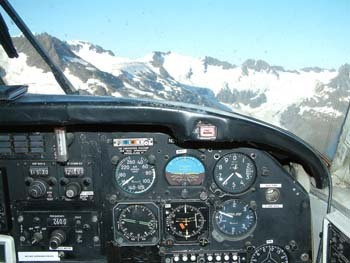 On completing the tour and said goodbye to our friend Stuart we headed back to Trans Northern's ramp for another charter - this time to view the glaciers from a Beech 99 - with Pete the pilot, who only looked like had reached puberty last week! Taxiing from Lake Hood, over the road with the cars and trucks waiting patiently for us to cross, for a departure on runway 17L at ANC. 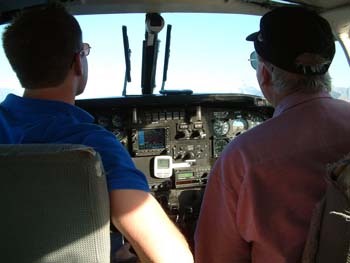 We stopped shortly before the threshold to take a call on his mobile from his girlfriend who was expecting him home for dinner to which he responded that he had a bunch of crazy Brits in a plane who wanted to do some flying and he would be back in an hour. 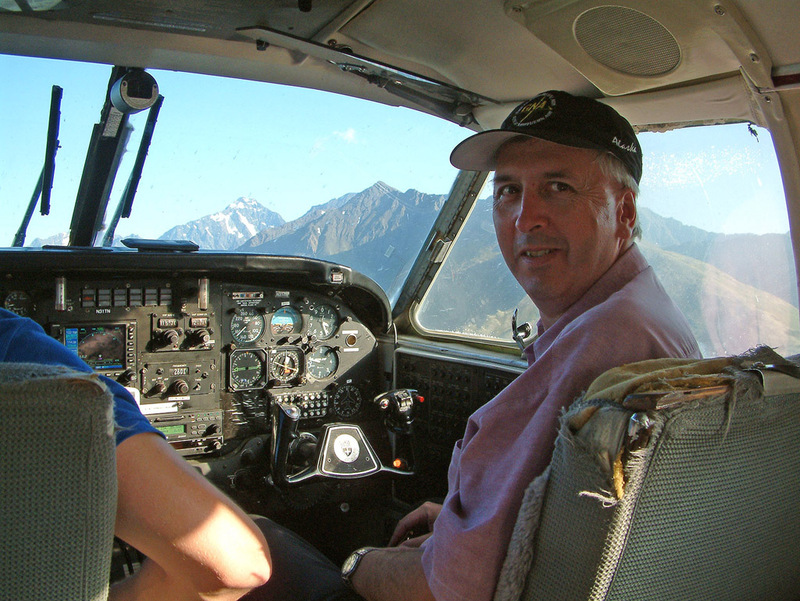 Pete then subsequently taxied onto the runway and took off for the flight of a lifetime! 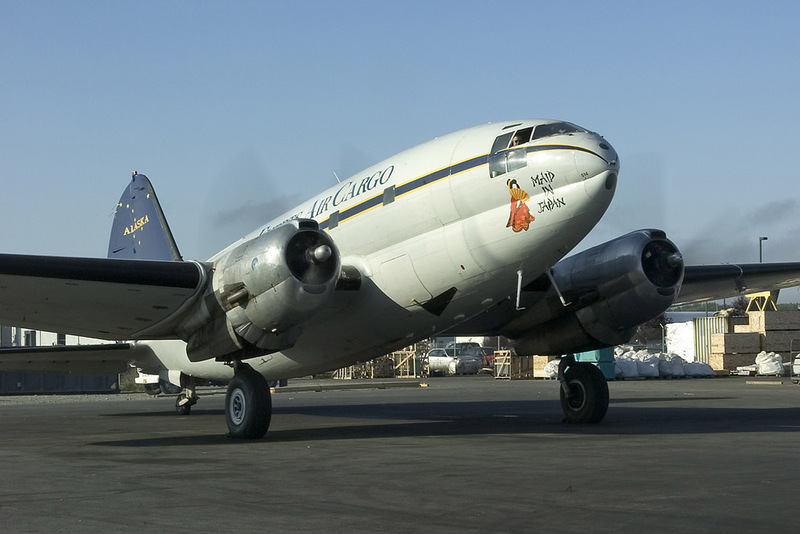 If we had previously thought the Super DC-3 flight was close to some of the rocks - at least it was flying in a straight line and lumbered around the sky - not the most maneuverable aircraft! 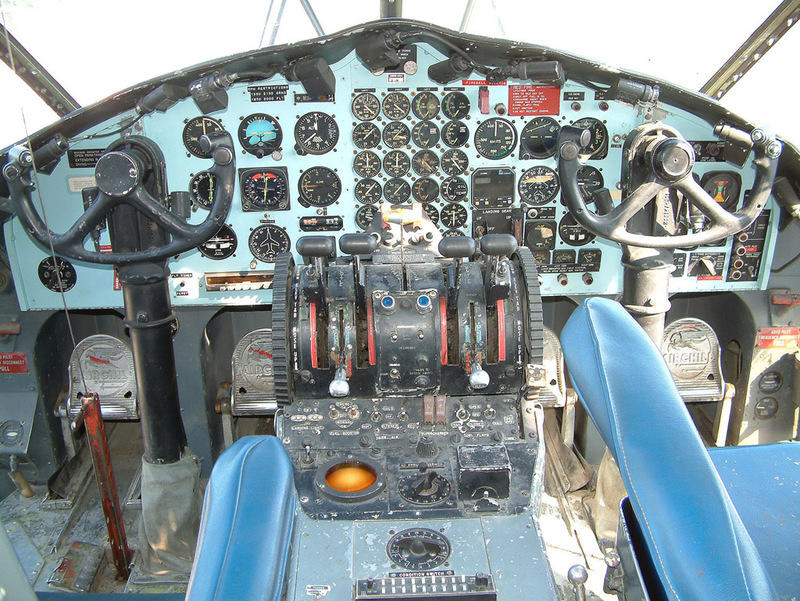 The Beech 99 was the opposite - maneuverable and fun - and fast to respond. We were then treated to displays of glaciers breaking up and falling into the lake as well as some of the most stunning scenery ever to be seen - Pete enjoying this so much he put the Be99 into an infeasibly tight turns to see some of it again! 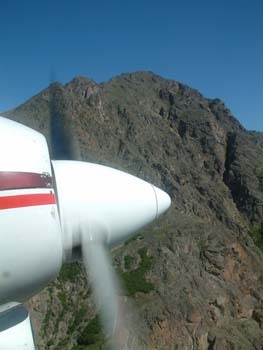 On this flight we were so close to the rocks that we thought we might have to charter a helicopter to collect some of the bits left behind! 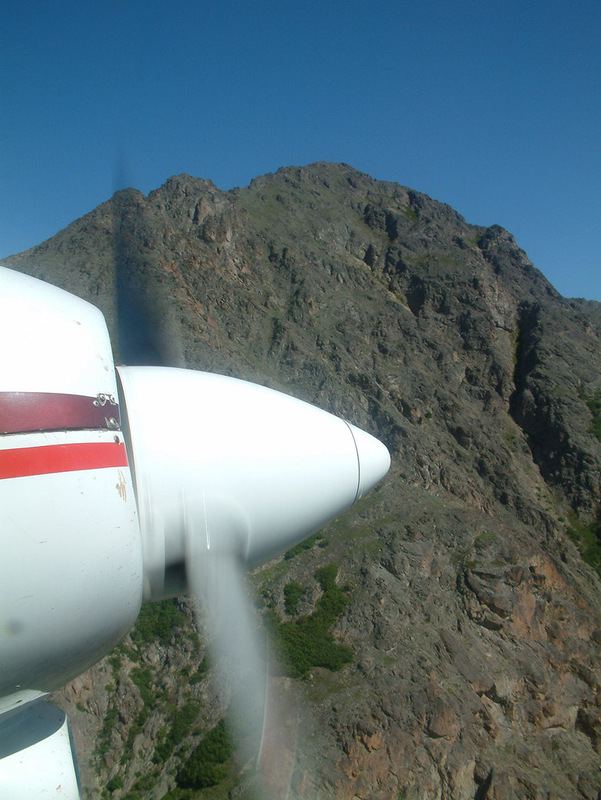 Just short of an hour later we arrived back at Anchorage for an arrival on Lake Hoods gravel strip touching down at exactly where the pink bollards are to mark out the start of the strip! Pete's precision piloting skills were certainly in evidence throughout and he even admitted afterwards "that really was fun!". 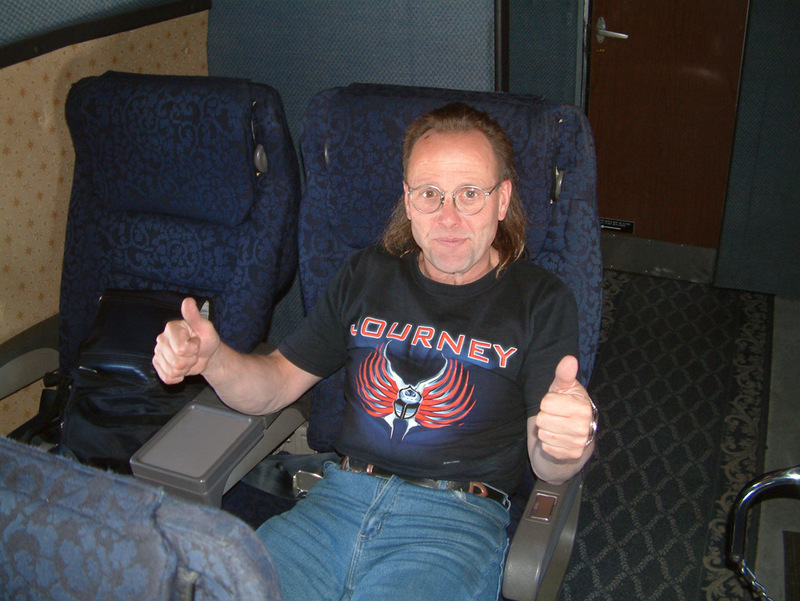 The only way to finish the day after that was with some beer. 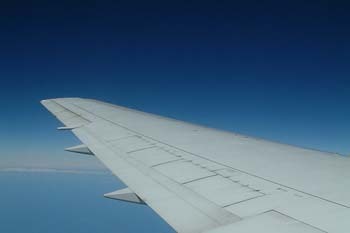 The final day had come around all too quickly - but again was to be adventure filled. 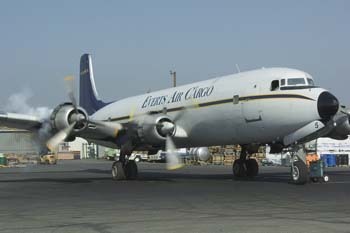 An early start to witness one of Evert's C-46's, N54514, start up. 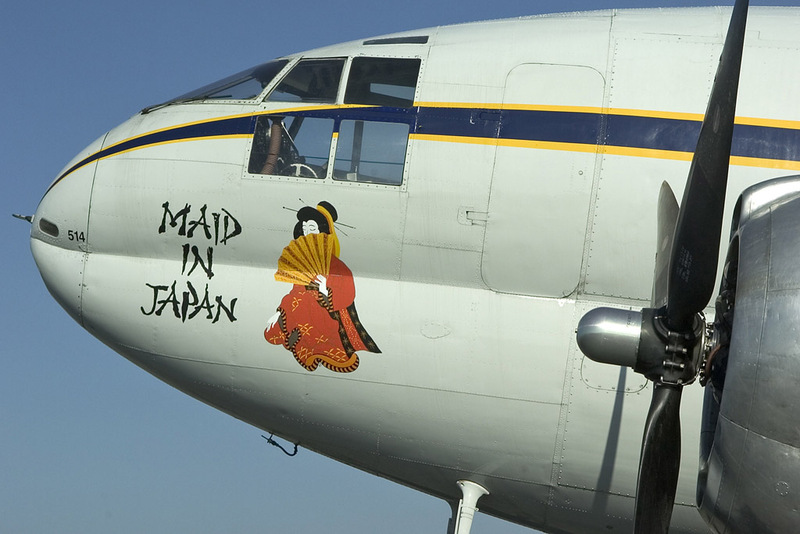 The aircrafts name, "Maid In Japan", upsets some American visitors to Evert's who still have vivid memories of WWII and the staff often have to explain the story behind the name. 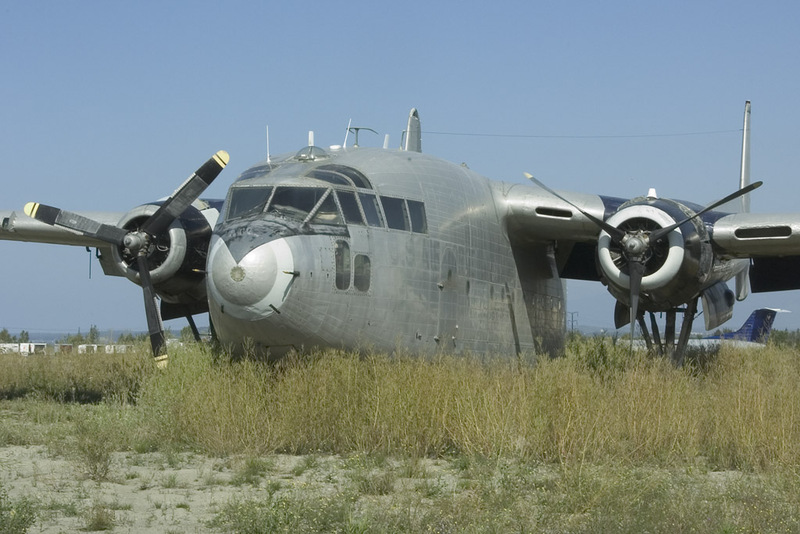 Immediately after the end war Japans armed forces, including the air force, were dissolved and were only allowed to be reformed by the allies as the Japan Air Self Defence Force several years later. 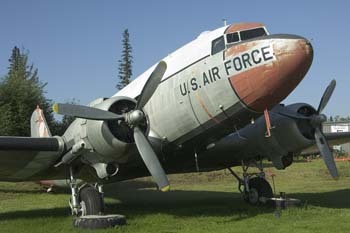 JASDF was initially equipped with surplus USAAF aircraft including a number of C-46's which were lovingly cared for by the Japanese for many years. When the aircraft came to Evert's they found that they had been so well looked after they seemed almost new. 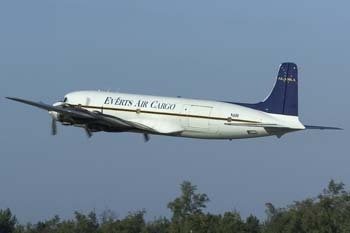 Evert's have kept up the tradition of looking after the C-46's - so even though we were excited about watching the aircraft being started by the German/Russian crew it was tinged with a slight disappointment as there wasn't a single puff of smoke from the engines - full credit to the maintenance team. 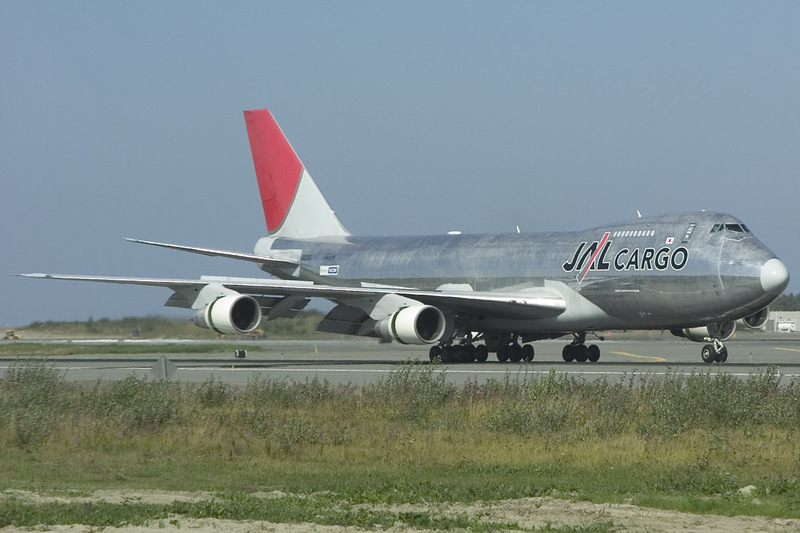 After several minutes of thoroughly testing the engines "Maid In Japan" taxied out to earn her keep once more. 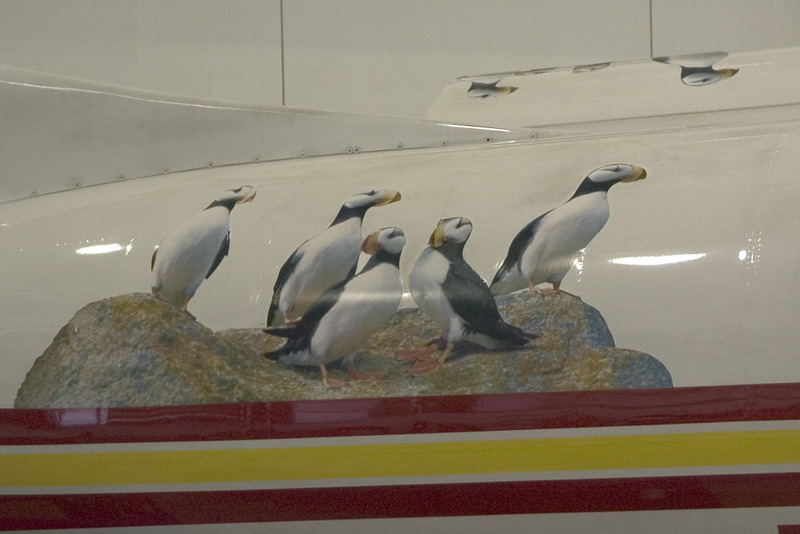 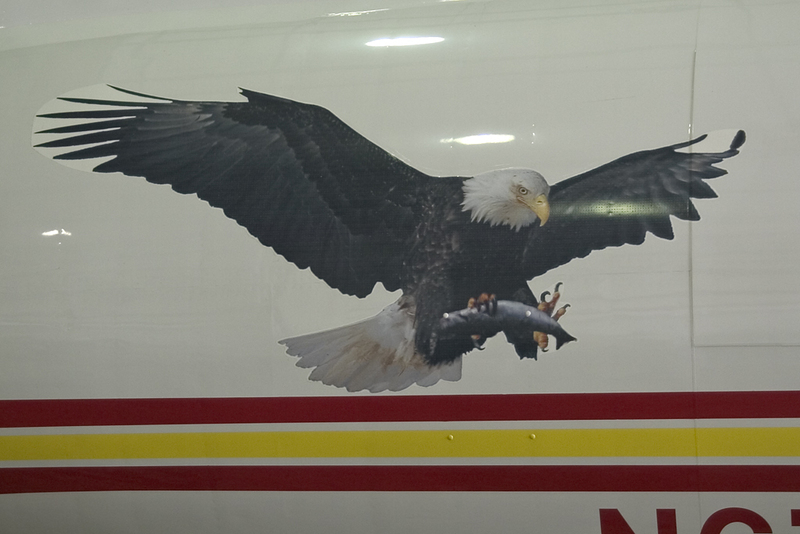 Before moving on we took a chance and asked at Penair's hangar - many of their aircraft have special schemes with picutres of wildlife on the side - again a more than warm welcome with access to their hangar and ramp. Contacts were made for a possible Goose flight on a return visit! 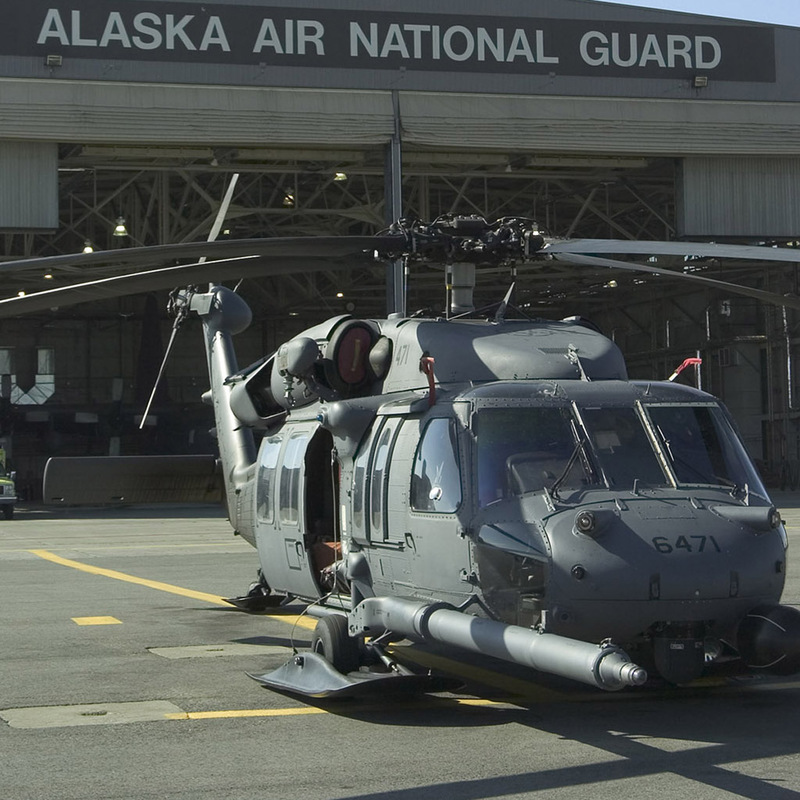 Next stop on this whirlwind visit to Alaska was Fort Richardson ANGB, a short drive up the Glen Highway, where we were treated to another cracking tour being able to walk around all their C-23 Sherpas and UH-60 Blackhawks. Again this unit is preparing for a visit to Iraq - and not for the first time either. 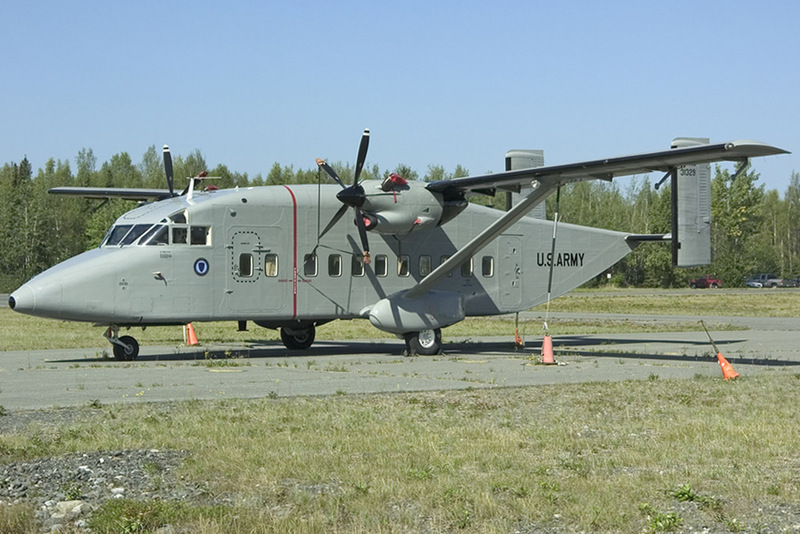 There is currently a program underway to replace the Sherpas and currently the C-27J Spartan and Casa 235 are the current front runners. 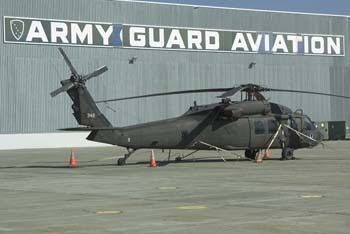 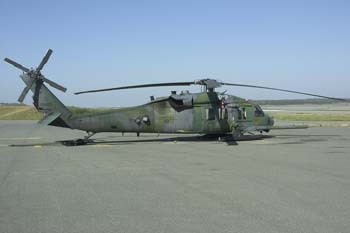 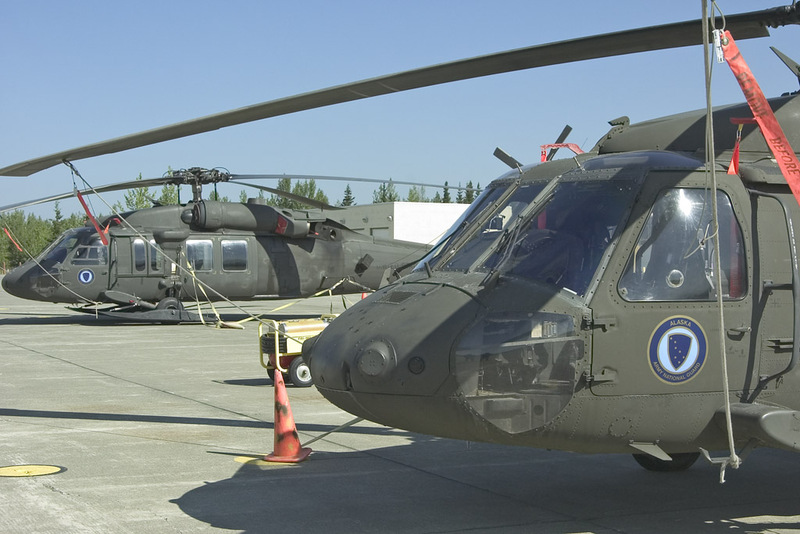 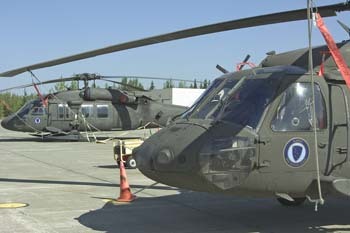 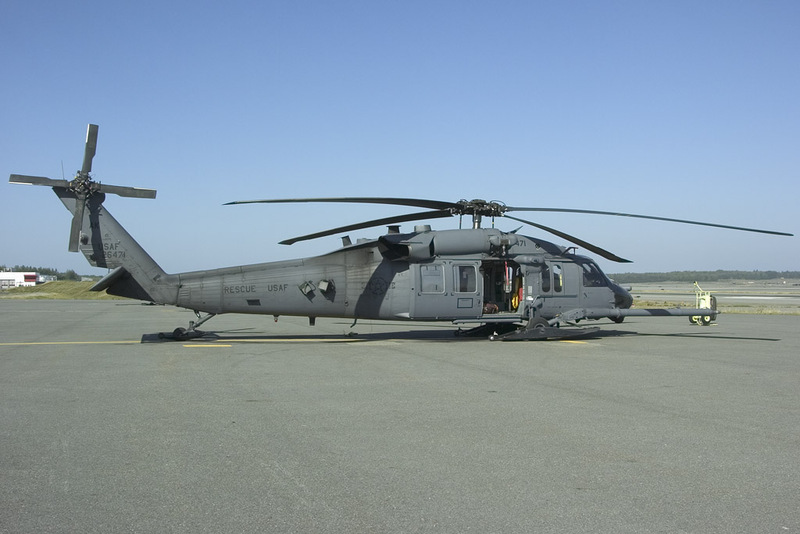 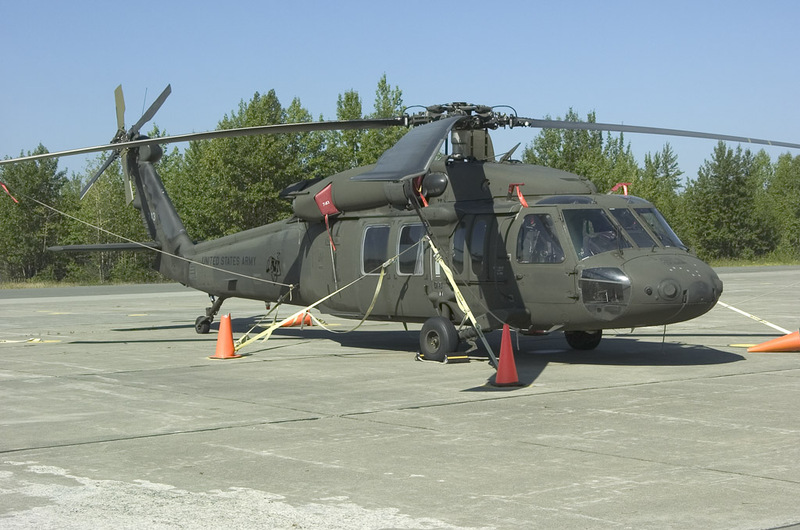 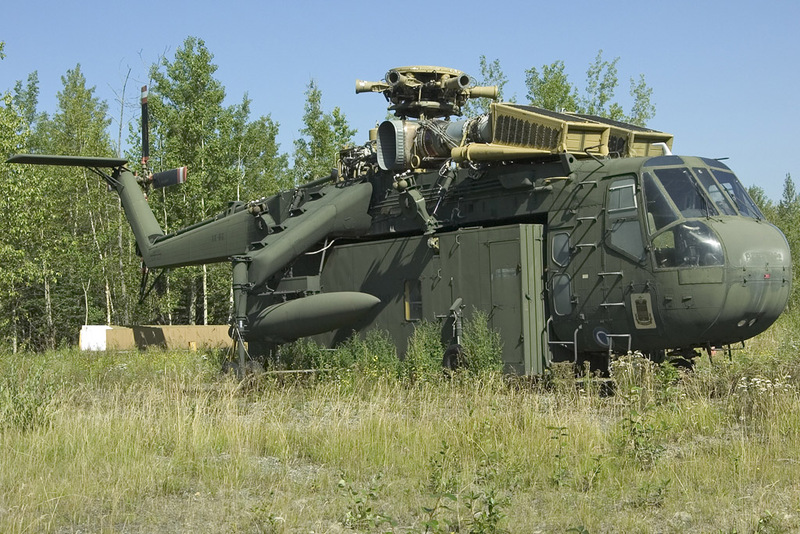 Again like its Air Force counterparts at Kulis, the primary role is Search and Rescue and the UH-60's are currently undergoing a mod program as well. 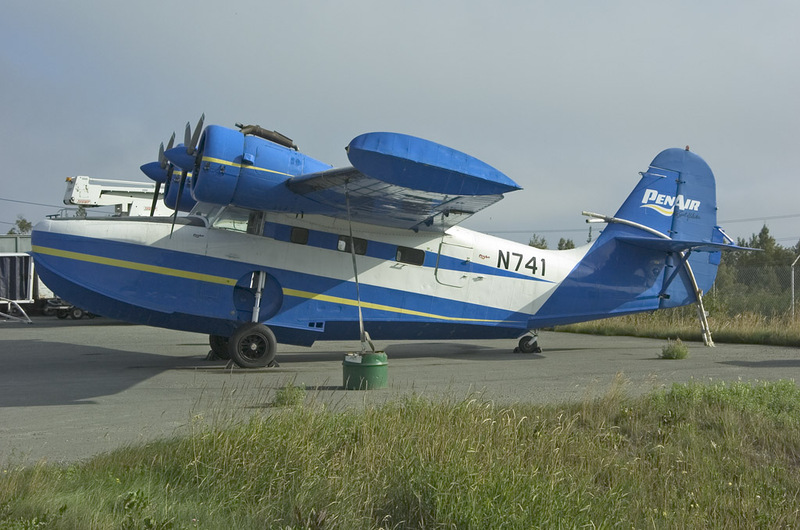 All too soon we say farewell and for the final time head back to Anchorage. One thing I had always wanted to do was fly in a float plane - and we were desperately trying to organize one. Regal Air had promised us a flight the day before - but the aircraft went tech - problem with the air conditioning. Today sea fog had engulfed large portions of the coastal areas which meant a lot of flying was either cancelled or delayed. 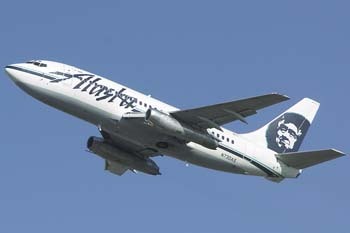 So even though our plane was repaired it was now earning its keep flying tourists to and from their vacation spots - but they promised us a flight - and they were going to keep that promise - just delayed. 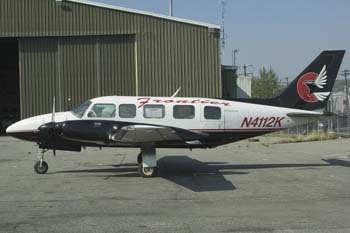 And so the intrepid journeymen boarded one Regal Air's Beavers, N9877R. 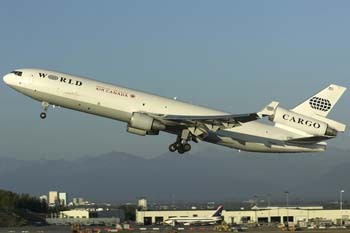 On lake Hood there are restrictions to the amount of noise aircraft can make and how fast they can taxi but once the "waterway" had been reached and clearance had been received, "Regal Air 77R" started her run for an interesting curved take-off! 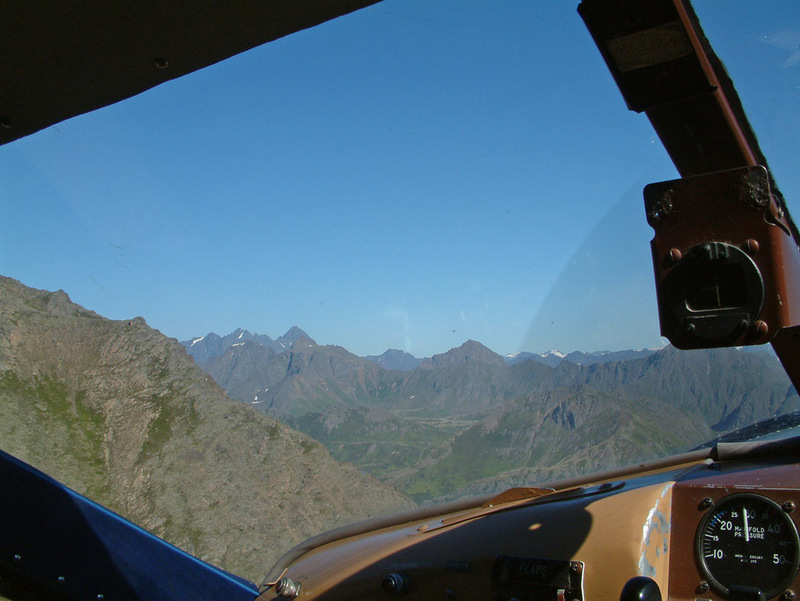 Once again we had a pleasant run around the mountains - the pilots thinking we want to look at the wildlife whilst the passengers absorb the atmosphere of flying in such a rare aircraft. The flight ended far too soon with a steep approach into the Lake but the landing was so smooth I didn't even realize we had "splashed down". Whilst on approach we had heard "Fairchild 404" in the circuit and it had landed shortly after us - albeit on the gravel strip. 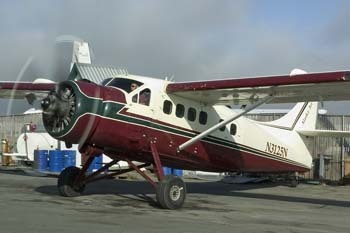 This was none other than a 1940 Fairchild 24, marketed and more commonly known over in Europe as an Argos - another rarity in Alaska. 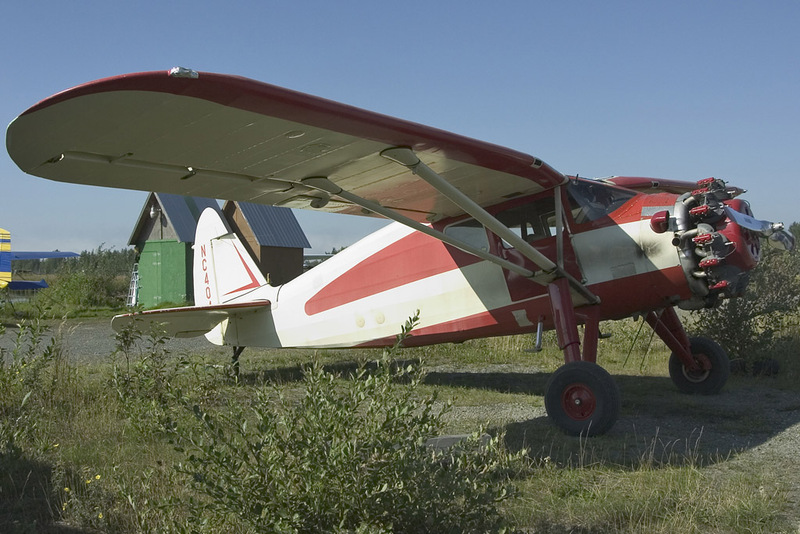 The party quickly moved over to where it had parked with the owner completely bowled over by the interest we were showing in his beautifully looked after aircraft. 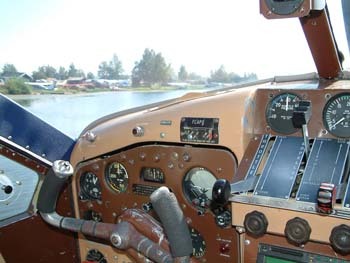 In fact he was so taken aback that he offered to take us for a quick spin in Lake Hood's circuit. 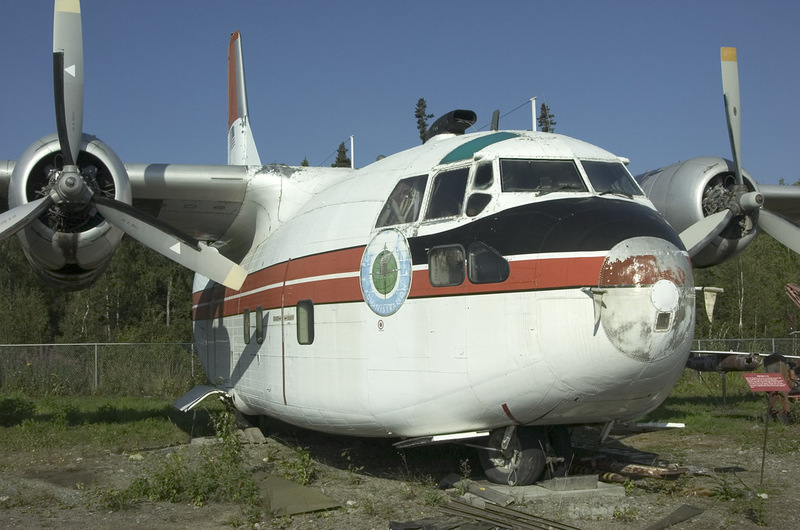 The Argos is a fabric covered aeroplane and with Alaska getting little direct and harsh sunlight aircraft don't need recovering whereas in the lower 48 and Europe they need to be recovered every few years or be constantly hangared. In contrast, the severe cold and snow of the winters here in Alaska apparently have little negative affect on the fabric when kept outside. 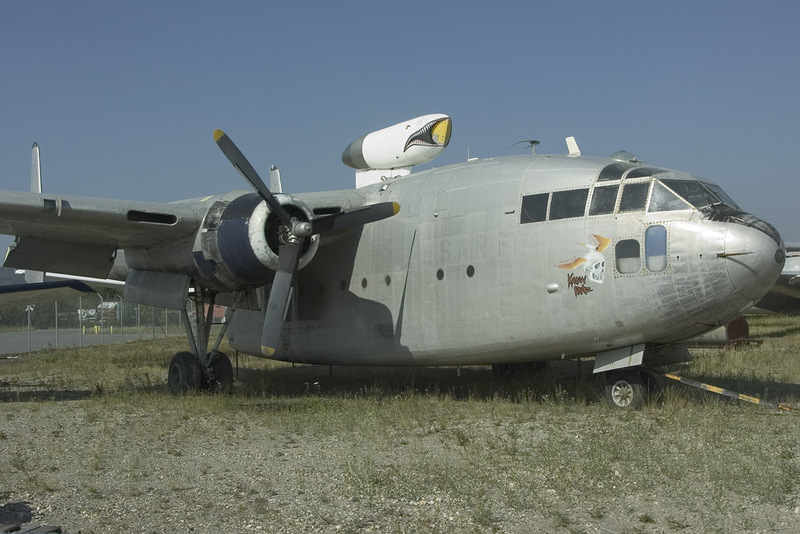 Whilst walking around the airfield we found one example of a fabric covered aircraft where the owner told us it hadn't been re-covered for over 40 years - everything else had been changed though including several wives! 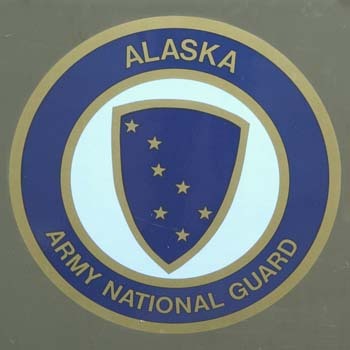 Four days had passed so quickly with so much achieved and my visit to Alaska was over far too soon; I made a promise to myself that next time I won't leave it quite so long - nor will the visit be quite so short. Due to work commitments I had to be in work at 9am on the Monday morning so taking an overnight flight from the USA to UK was my only option - this provided me with some outstanding sunset shots as I flew across the UK. 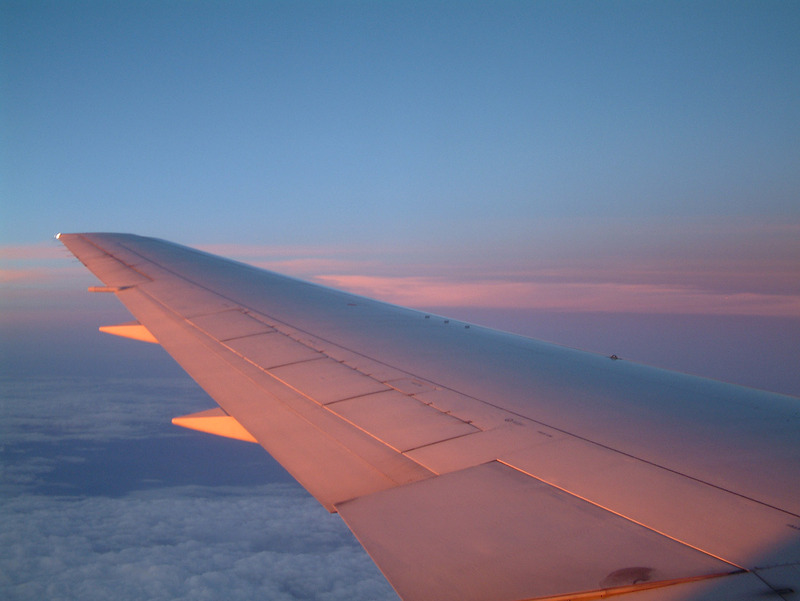 One thing I did find is that taking the return daytime flight resulted in no jet-lag - this is something I will consider for the future! Special thanks to Steve Kinder for leading and organising the most outstanding George Pick Aerotours trip I had ever been on.